The following articles are selected highlights from topics that I am genuinely interested in. For a full list of publications, please see below or have a look at my profile at Google Scholar. 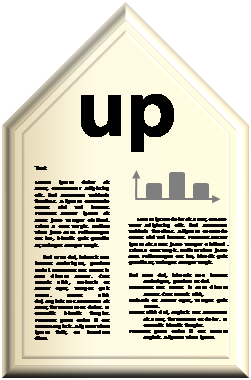 Icons accompanying each article allow for a quick glance at the abstract ( ), link the article PDF ( ), and provide links to the publisher URLs ( ). In support of the open data movement, I am currently working to provide direct links to materials and data to download from this homepage ( ) and on dedicated project pages on the Open Science Framework (OSF; ). Deliberate rule violations have typically been addressed from a motivational perspective that asked whether or not agents decide to violate rules based on contextual factors and moral considerations. Here we complement motivational approaches by providing a cognitive perspective on the processes that operate during the act of committing an unsolicited rule violation. Participants were tested in a task that allowed for violating traffic rules by exploiting forbidden shortcuts in a virtual city maze. Results yielded evidence for sustained cognitive conflict that affected performance from right before a violation throughout actually committing the violation. These findings open up a new theoretical perspective on violation behavior that focuses on processes occurring right at the moment a rule violation takes place. Rule compliance is pivotal for the regulation of social behaviour. Still, humans deliberately violate rules at times � be it for personal reasons or for a higher good. Whereas previous research has studied the preconditions and consequences of rule violations, essentially nothing is known about the cognitive processes right at the moment a rule violation takes place. Here we show that merely labeling an action as rule violation induces a strong conflict between rule violation and compliance, as revealed by participants� bias towards rule complying motor actions. Moreover, conflict that comes with violating a rule was much stronger than conflict that comes with following an alternative rule, even if both decisions result in the same observable behavior. These observations open a new theoretical perspective on rule violation behavior, shifting the focus toward the cognitive processes operating during the very act of rule violation. Ideomotor accounts to human action control posit that human agents represent actions in terms of their perceivable consequences; selecting, planning, and initiating a voluntary action is thus assumed to be mediated by action-effect anticipations. Corresponding empirical investigations have often employed arbitrary effects in the agent�s environment to study action-effect learning and effect-based action control. This strategy has provided accumulating evidence in support of ideomotor mechanisms but the widespread focus on environment-related action effects has also created misperceptions of what ideomotor accounts aim to explain. Moreover, this strategy also has given rise to misunderstandings of critical epistemological limitations, especially regarding the theoretical relevance of negative results in common experimental paradigms. These recent developments call for a theoretical clarification of the concept of action effects. I propose that many misunderstandings can be resolved by embracing the theoretical role of body-related as compared to environment-related actions effects. I show how the concept of such effects may inform current debates and how this focus can guide future research related to ideomotor action control, with a main challenge being the derivation of testable and falsifiable theories from the ideomotor framework. Imitation is assumed to serve crucial functions in social interaction such as empathy and learning; yet these functions only apply to the imitating observer. Here, we reveal a distinct function of imitation for the action model: Anticipating to be imitated facilitates the production of own motor actions. Specifically, anticipated motor responses of social counterparts serve as mental cues to retrieve corresponding motor commands in order to orchestrate one�s own actions. Valued by statisticians, enforced by editors, and confused by many authors, standard errors (SEs) and confidence intervals (CIs) remain a controversial issue in the psychological literature. This is especially true for the proper use of CIs for within-subjects designs, even though several recent publications elaborated on possible solutions for this case. The present paper presents a short and straightforward introduction to the basic principles of CI construction, in an attempt to encourage students and researchers in cognitive psychology to use CIs in their reports and presentations. Focusing on a simple but prevalent case of statistical inference, the comparison of two sample means, we describe possible CIs for between- and within-subjects designs. In addition, we give hands-on examples of how to compute these CIs and discuss their relation to classical t-tests. As early as 1783, the almost forgotten philosopher, metaphysicist, and psychologist Ferdinand Ueberwasser (1752-1812), designated himself �Professor f�r empirische Psychologie und Logik�, professor of empirical psychology and logic, at the University of M�nster, Germany. His position was initiated and supported by the minister and educational reformer Franz von F�rstenberg (1729-1810), who considered psychology a core scientific discipline, to be taught at each school and university. At the end of the 18th century, then, psychology seems to have been on the verge of becoming an independent academic discipline, about 100 years before Wilhelm Wundt founded the discipline�s first official laboratory. It seems surprising that Ueberwasser�s writings � including a seminal textbook on empirical psychology � have been almost entirely overlooked by most historical accounts. We focus on this important founding moment of psychological science, and on the circumstances that eventually brought this seminal development to a halt. As the empirical study of action control via ideomotor effect-anticipations continues to uncover more and more aspects of this fundamental process, it is time to look back to the 19th century roots of the theory to assess which classic ideas are supported by contemporary research. In turn, classic ideas might stimulate studies on aspects of the ideomotor mechanism that have not yet been addressed empirically. The present article is a tribute to this classical work � more precisely to the article �Der Apparat des Willens� [The Apparatus of Will], published by Emil Harle� 150 years ago. At a closer look, Harle� does not only present a concise description of the ideomotor mechanism; he also presents a wealth of intriguing ideas that deserve empirical investigation. Janczyk, M., & Pfister, R. (2015). Inferenzstatistik verstehen. Von A wie Signifikanztest bis Z wie Konfidenzintervall. 2. Auflage. [Understanding inferential statistics. From A as in significance test to Z as in confidence interval. 2nd Ed.]. Heidelberg: Springer. Dieses Buch bietet eine kompakte und verst�ndnisorientierte Einf�hrung in die Inferenzstatistik. Ein Schwerpunkt ist dabei die zugrundeliegende Logik der Inferenzstatistik und des Hypothesentestens. Dies erm�glicht es, die T�cken der Datenauswertung kennenzulernen und Ergebnisse richtig zu interpretieren. Dar�ber hinaus wird die Logik auf die g�ngigsten Verfahren (t-Test, Varianzanalyse mit und ohne Messwiederholung, Korrelation/Regression) �bertragen. Eine Erg�nzung liefern Beispiele aus dem Forschungsalltag inklusive exemplarischer Auswertungen mit den Programmen SPSS und R. Die zweite Auflage bietet neben zahlreichen sprachlichen �berarbeitungen verschiedene Querverweise auf aktuelle Entwicklungen der psychologischen Methodenforschung. Pfister, R. (2013). Breaking the rules: Cognitive conflict during deliberate rule violations. Berlin: Logos. Violation of rules and norms is a common phenomenon in human societies. Whereas behavioural research has delineated situational and organizational determinants of rule violations, very little is known about the consequences of this behaviour right at the moment it takes place. The present experiments show that the mere fact of violating a rule leaves a fingerprint on the acting agent, indicating that rule representations cannot be suppressed easily. This holds true even when violations are neither sanctioned nor yield any other obvious consequences. These observations open a new perspective on rule violation behaviour, shifting the focus from predicting whether or not violations are likely to occur to the processes involved in actually performing the behaviour. Was bedeutet eigentlich dieser p-Wert? Und was hei�t es, zu sagen: �Das Ergebnis ist signifikant!�? Dieses Buch bietet eine kompakte und verst�ndnisorientierte Einf�hrung in die Inferenzstatistik mit dem Ziel, solche Fragen korrekt beantworten zu k�nnen. Der Schwerpunkt des Buches liegt dabei auf der Logik, die der Inferenzstatistik und dem Hypothesentesten zugrunde liegt. Damit wird es der Leserin und dem Leser erm�glicht, die T�cken der Datenauswertung kennenzulernen und Ergebnisse richtig zu interpretieren. Dar�ber hinaus wird diese Logik auf die am h�ufigsten verwendeten Verfahren (t-Test, Varianzanalyse mit und ohne Messwiederholung, Korrelation/Regression) �bertragen. Erg�nzt werden die Kapitel durch Auswertungsbeispiele aus dem Forschungsalltag inklusive beispielhafter Auswertungen mit den Programmen SPSS und R.
Wirth, R., Kunde, W., & Pfister, R. (in press). How not to fall for the white bear: Combined frequency and recency manipulations diminish negation effects on overt behavior Journal of Cognition. Processing negated mental representations comes with a price: Not only are negations harder to resolve than affirmative statements, but they may even invoke ironic effects, producing the exact opposite of the intended outcome. Negation effects also behave ironically when subjected to high-frequency training; when they are confronted often, the difficulty to process negations strangely increases. Here we show that negation effects can be mitigated under certain circumstances. Based on models of cognitive control and conflict adaptation, we hypothesized that negation effects diminish when two criteria are met: negations have to be resolved not only frequently, but also just recently. We confirmed this prediction in two experiments by using an innovative, two-dimensional finger tracking design, in which we measured the influence of the original semantic content during negation processing via temporal and spatial measures. Negation effects were present throughout the experiment, but were reduced after recent negations, particularly during or after a high-frequency negation context. The combined influence of frequency and recency thus seems to be the most successful and promising attempt to mitigate ironic negation effects on overt behavior. The sociomotor framework proposes that people can represent their actions in terms of the behavior these actions evoke in others, so that anticipating the behavior of others triggers own actions. In social interactions, such as imitation, it thus highlights the acting model rather than the responding person. In line with this idea, motor actions are facilitated if they are foreseeably imitated rather than counterimitated by a social partner. In the present study, we investigate how exactly another�s behavior is represented in such sociomotor actions. The effect of being imitated can be explained by two distinct forms of compatibility between model and imitator actions: correspondence of anatomical features (imitative compatibility) and correspondence of spatial features (spatial compatibility). Both types of features often go hand in hand, though research on motor priming shows that spatial and anatomical features of other�s actions are represented independently. We therefore investigated to which degree the benefit of anticipated imitation is caused by spatial or imitative compatibility. Across five experiments, we found that only spatial compatibility of the imitator�s behavior influenced the model�s actions, while imitative compatibility had no influence. Actors thus seem to represent actions of their social partners mainly in terms of non-social, spatial features. Effect-based accounts of human action control have recently highlighted the possibility of representing one�s own actions in terms of its anticipated changes in the behavior of social interaction partners. In contrast to action effects that pertain to the agent�s body or the agent�s physical environment, social action effects have been proposed to come with peculiarities inherent to their social nature. Here we revisit the currently most prominent demonstration of such a peculiarity: the role of eye-contact for action-effect learning in social contexts (Sato & Itakura, 2013). In contrast to the previous demonstration of action-effect learning, a conceptual and a direct replication both yielded evidence for the absence of action-effect learning in the proposed design irrespective of eye-contact. Bayesian statistics supported this claim by demonstrating evidence in favor of the null hypothesis of no effect. These results suggest a limited generalizability of the original findings, for example, due to limitations that are inherent in the proposed study design or due to cultural differences. Pfeuffer, C. U., Pfister, R., Foerster, A., Przybylski, F., & Kiesel, A. (in press). Binding Lies: Flexible retrieval of honest and dishonest behavior. Journal of Experimental Psychology: Human Perception and Performance. Telling a consistent lie across multiple occasions poses severe demands on memory. Two cognitive mechanisms aid with overcoming this difficulty: Associations between a question and its corresponding response and associations between a question and its previous intentional context (in this case: honest vs. dishonest responding). Here, we assessed whether intentional contexts such as an honest versus dishonest mindset modulate the retrieval of stimulus-response (S-R) associations. In an item-specific priming paradigm, participants classified stimuli either honestly or dishonestly during a prime and a later probe. The results of three experiments yielded automatic retrieval of the previously primed motor responses (for both honest and dishonest responses) only when the intentional context repeated but not when it switched. These findings indicate interdependent associations between a stimulus, its intentional context, and the corresponding response, allowing for flexible, context-specific retrieval. Thus, humans benefit from prior learning history without incurring costs when the intentional context changes. This finding implies top-down control over the retrieval of S-R associations and provides new insights into the mechanisms of associative learning. Recent research has suggested that sequential changes in the prospect of performance-contingent rewards may influence the balance between cognitive flexibility and stability: whereas constant high reward prospect seems to promote cognitive stability, increasing reward prospect has been shown to promote flexible behavior in voluntary task switching paradigms. Previous studies, however, confounded cognitive flexibility regarding voluntary task choices with control processes during task execution. We present five experiments to dissociate these two processes by means of a double registration procedure, in which task choice is registered prior to task execution. The data yielded clear evidence for reward-driven modulation of the flexibility-stability balance already at the level of task choices, with higher voluntary switch rates when reward prospect increased as compared to situations in which reward prospect remained high. This effect was further modulated by the specific type of registration procedure, suggesting that only deliberate task choices are affected by the reward sequence. These results thus confirm that the prospect of performance-contingent reward can indeed promote either cognitive stability or flexibility depending on the immediate reward history. Frings, C., Koch, I., Rothermund, K., Dignath, D., Giesen, C., Hommel, B., Kiesel, A., Kunde, W., Mayr, S., Moeller, B., M�ller, M., Pfister, R., & Philipp, A. (in press). Merkmalsintegration und Abruf als wichtige Prozesse der Handlungssteuerung � eine Paradigmen-�bergreifende Perspektive. Psychologische Rundschau. Cognitive theories of dishonesty revolve around an automatic activation of honest response tendencies, which is assumed to impair response selection for the intended dishonest response. Clear-cut evidence for the claim is still limited, however. We therefore present a novel approach to dishonest responding that takes advantage of psychological refractory period (PRP) methodology. Four experiments yielded evidence supporting the assumption of prolonged response selection during dishonest responding. Moreover, they also showed differences in early response activation and they revealed additional downstream consequences of this behavior that are currently not sufficiently covered by common theoretical models. Notably, these downstream consequences included increased monitoring relative to honest behavior. Our results thus provide an extensive coverage of the cognitive architecture of dishonest responses, informing current theorizing while simultaneously grounding the assumed processes in the framework of sensorimotor stage models of information processing. Conduct disorder is characterized by both habitual aggression as well as non-aggressive rule-breaking behavior. While a large body of research has focused on aggressive behavior to date, the subtype of non-aggressive rule-breaking behavior is poorly understood. The current study represents a first attempt to directly assess decision biases toward rule-breaking behavior, their motivational salience, and the association with interpersonal factors in conduct disorder. Participants (n=20 children with conduct disorder and n=20 healthy controls) played a video game with the goal to deliver a hot pizza by bicycle to a marked location on a two-dimensional city map. In each trial, participants decided whether to use the regular route (streets) or opt for a potential shortcut that was either permitted (bicycle lane) or prohibited (park). The efficiency of the shortcut was parametrically varied to assess individual decision functions. Consistent with our hypotheses, group differences emerged only when taking a shortcut represented a rule-violation (park condition), with the conduct disorder group committing significantly more rule-violations than controls. Furthermore, conduct disorder children showed a substantial frequency of rule-violations even in the absence of shortcut-related gains, indicating a pronounced insensitivity towards sanctions. Importantly, this tendency was associated with self-reported impulsivity and rule-violations in real life. Rule violations have usually been studied from a third-person perspective, identifying situational factors that render violations more or less likely. A first-person perspective of the agent that actively violates the rules, on the other hand, is only just beginning to emerge. Here we show that committing a rule violation sensitizes towards subsequent negative stimuli as well as subsequent authority-related stimuli. In a Prime-Probe design, we used an instructed rule violation task as the Prime and a word categorization task as the Probe. Also, we employed a control condition that used a rule inversion task as the Prime (instead of rule violations). Probe targets were categorized faster after a violation relative to after a rule-based response if they related to either, negative valence, or authority. Inversions, however, primed only negative stimuli and did not accelerate the categorization of authority-related stimuli. A heightened sensitivity towards authority-related targets thus seems to be specific to rule violations. A control experiment showed that these effects cannot be explained in terms of semantic priming. Therefore, we propose that rule violations necessarily activate authority-related representations that make rule violations qualitatively different from simple rule inversions. Violating social rules comes with cognitive conflict for the rule-breaker. Here we probed for means to reduce the behavioral effects of this conflict by studying the combined impact of recency and frequency of rule violations. We found that violating a rule facilitated the initiation of a subsequent rule violation, while notable costs relative to rule-based responding remained in measures of response execution. Such costs during response execution vanished, however, when frequency and recency of rule violation worked in concert. That is: It is possible to overcome the costs of rule violation when (a) having violated this particular rule frequently and (b) having violated this particular rule very recently. Moreover, we demonstrate that recent rule violations reduce costs of cognitive conflict in an unrelated interference task (Simon task). Based on these findings, we present a revised model on the cognitive processes underlying deliberate rule violations. We often ask other people to carry out actions for us in order to reach our goals. However, these commanded actions may sometimes go awry and goal attainment is hindered by errors of the following person. Here we investigated how the commanding person processes these errors of their follower. Because such errors indicate that the original goal of the command is not met, error processing for these actions should be enhanced compared to passively observing another person�s actions. Participants thus either commanded another agent to perform one of four keypress responses or they passively observed the agent responding. The agent could respond correctly or commit an error in either case. We compared error processing of commanded and passively observed actions using observation-related post-error slowing (oPES) as a behavioral marker and observed-error-related negativity (oNE/oERN) and observed-error positivity (oPE) as electrophysiological markers. Whereas error processing, as measured via the oERN, was similarly pronounced for commanded and observed actions, commanded actions gave rise to stronger oPES and a stronger oPE. These results suggest that enhanced monitoring is an automatic by-product of commanding another person�s actions. According to famous physicist Niels Bohr, gunfights at high noon in Western movies do not only captivate the cinema audience, but they also provide an accurate illustration of a psychophysical law. He suggested that willed actions come with slower movement execution than reactions and therefore, a film�s hero is able to get the upper hand even though the villain normally draws first. A corresponding �Gunslinger effect� has been substantiated by empirical studies. Because these studies used a markedly competitive setting, however, it is currently unclear whether the Gunslinger effect indeed reflects structural differences between willed actions and reactive movements, or whether it is a by-product of the competitive setting. To obtain bullet-proof evidence for a true reactive advantage, we investigated willed and reactive movements during a cooperative interaction of two participants. A pronounced reactive advantage emerged, indicating that indeed two independent systems control willed and reactive movements. We argue that making accept/reject decisions on scientific hypotheses, including a recent call for changing the canonical alpha level from p = .05 to .005, is deleterious for the finding of new discoveries and the progress of science. Given that blanket and variable alpha levels both are problematic, it is sensible to dispense with significance testing altogether. There are alternatives that address study design and sample size much more directly than significance testing does; but none of the statistical tools should be taken as the new magic method giving clear-cut mechanical answers. Inference should not be based on single studies at all, but on cumulative evidence from multiple independent studies. When evaluating the strength of the evidence, we should consider, for example, auxiliary assumptions, the strength of the experimental design, and implications for applications. To boil all this down to a binary decision based on a p-value threshold of .05, .01, .005, or anything else, is not acceptable. Anticipated action effects have been shown to govern action selection and initiation, as described in ideomotor theory, and they have also been demonstrated to determine crosstalk between different tasks in multitasking studies. Such effect-based crosstalk was observed not only in a forward manner (with a first task influencing performance in a following second task) but also in a backward manner (the second task influencing the preceding first task), suggesting that action effect codes can become activated prior to a capacity-limited processing stage often denoted as response selection. The process of effect-based response production, by contrast, has been proposed to be capacity-limited. These observations jointly suggest that effect code activation can occur independently of effect-based response production, though this theoretical implication has not been tested directly at present. We tested this hypothesis by employing a dual-task set-up in which we manipulated the ease of effect-based response production (via response-effect compatibility) in an experimental design that allows for observing forward and backward crosstalk. We observed robust crosstalk effects and response-effect compatibility effects alike, but no interaction between both effects. These results indicate that effect activation can occur in parallel for several tasks, independently of effect-based response production, which is confined to one task at a time. Sensory consequences of an agent�s actions are perceived less intensely than sensory stimuli that are not caused (and thus not predicted) by the observer. This effect of sensory attenuation has been discussed as a key principle of perception, potentially mediating various crucial functions such as agency and the discrimination of self-caused sensory stimulation from stimuli caused by external factors. Precise models describe the theoretical underpinnings of this phenomenon across a variety of modalities, especially the auditory, tactile, and visual domain. Despite these strong claims, empirical evidence for sensory attenuation in the visual domain is surprisingly sparse and ambiguous. In the present article, we therefore aim to clarify the role of sensory attenuation for learned visual action effects. To this end, we present a comprehensive replication effort including three separate, high-powered experiments on sensory attenuation in the visual domain with one direct and two pre-registered, conceptual replication attempts of an influential study on this topic (Cardoso-Leite et al., 2010). Signal detection analyses were targeted to distinguish between true visual sensitivity and response bias. Contrary to previous assumptions and despite high statistical power, however, we found no evidence for sensory attenuation of learned visual action effects. Bayesian analyses further supported the null hypothesis of no effect, thus constraining theories that promote sensory attenuation as an immediate and necessary consequence of voluntary actions. The sense of agency is a pervasive phenomenon that accompanies conscious acting and extends to the consequences of one�s actions in the environment. Subjective feelings of agency are typically explained in terms of predictive processes, based on internal forward models inherent to the sensorimotor system, and postdictive processes, i.e., explicit, retrospective judgments by the agent. Only recently, research has begun to elucidate the link between sense of agency and more basic processes of human action control. The present study was conducted in this spirit and explored the relation between short-term action-effect binding and explicit agency judgments. We found evidence for such a link in that the participants� short-term action-effect binding predicted subsequent agency ratings. This offers a new perspective on the sense of agency, providing an additional mechanism (together with predictive and postdictive processes) that may underlie its formation. The late 18th century was a remarkable period for psychology. This was especially true for the Prince-Bishopric of M�nster, Germany, where a new era dawned with an extensive political, economic, and educational reform which would ultimately lead to the establishment of psychology as an independent discipline at the newly founded University of M�nster. But were these developments groundbreaking enough to advocate for pre-dating the beginnings of scientific psychology? Our actions affect the behavior of other people in predictable ways. In the present paper we describe a theoretical framework for action control in social contexts which we call sociomotor action control. This framework addresses how human agents plan and initiate movements that trigger responses from other people, and we propose that humans represent and control such actions literally in terms of the body movements they consistently evoke at observers. We review evidence for this approach and discuss commonalities and differences to related fields such as joint action, intention understanding, imitation, and interpersonal power. The sociomotor framework highlights a range of open questions pertaining to how representations of other persons� actions are linked to own motor activity, how specifically they contribute to action initiation, and how they affect the way we perceive the actions of others. Computer games have been proposed as effective tools for cognitive enhancement. Especially first-person shooter (FPS) games have been found to yield a range of positive effects, and these positive effects also apply to the domain of executive functioning. Only a particular area of executive functioning has been shown to resist training via FPS games, and this area is task-switching performance. Here we tested whether games of a different genre, real-time strategy (RTS) games, offer a more promising approach to improve task-switching performance, because RTS games capitalize on precisely this behavior. A high-powered, quasi-experimental comparison of RTS and FPS players indicated reliable costs for task-switching across both player groups � with similar performance on multiple indicators, comprising switch costs, mixing costs, voluntary switch rates, and psychological refractory period effects. Performance of both groups further did not exceed the performance of a control group of Chess and Go players. These results corroborate previous findings on the robustness of cognitive costs of task-switching. At the same time our results also suggest that the precise characteristics of different computer games might not be critical in determining potential training effects. Nurturing behavior may be critically influenced by the interplay of different hormones. The neuropeptide oxytocin is known to promote maternal behavior and its reduction has been associated with postpartum depression risk and child neglect. Contrariwise, the observed decrease in testosterone level during early parenthood may benefit caretaking behavior, whereas increased testosterone may reduce attention to infants. Here we used functional magnetic resonance imaging to investigate the interactive influence of testosterone and oxytocin on selective attention to and neural processing of the baby schema (BS). 57 nulliparous women performed a target detection task with human faces with varying degree of BS following double-blinded placebo-controlled oxytocin administration in a between-subjects design. Our results support the idea that oxytocin enhances attention to the BS. Oxytocin had a positive effect on activation of the inferior frontal junction during identification of infant targets with a high degree of BS that were presented among adult distractors. Further, activation of the putamen was positively correlated with selective attention to the BS, but only in women with high endogenous testosterone who received oxytocin. These findings provide initial evidence for the neural mechanism by which oxytocin may counteract the negative effects of testosterone in the modulation of nurturing behavior. Giving a dishonest response to a question entails cognitive conflict due to an initial activation of the truthful response. Following conflict monitoring theory, dishonest responding could therefore elicit transient and sustained control adaptation processes to mitigate such conflict, and the current experiments take on the scope and specifity of such conflict adaptation in dishonesty. Transient adaptation reduces differences between honest and dishonest responding following a recent dishonest response. Sustained adaptation has a similar behavioral signature but is driven by the overall frequency of dishonest responding. Both types of adaptation to recent and frequent dishonest responses have been separately documented, leaving open whether control processes in dishonest responding can flexibly adapt to transient and sustained conflict signals of dishonest and other actions. This was the goal of the present experiments which studied (dis)honest responding to autobiographical yes/no questions. Experiment 1 showed robust transient adaptation to recent dishonest responses whereas sustained control adaptation failed to exert an influence on behavior. It further revealed that transient effects may create a spurious impression of sustained adaptation in typical experimental settings. Experiments 2 and 3 examined whether dishonest responding can profit from transient and sustained adaption processes triggered by other behavioral conflicts. This was clearly not the case: Dishonest responding adapted markedly to recent (dis)honest responses but not to any context of other conflicts. These findings indicate that control adaptation in dishonest responding is strong but surprisingly focused and they point to a potential trade-off between transient and sustained adaptation. Actions of others automatically prime similar responses in an agent�s behavioural repertoire. As a consequence, perceived or anticipated imitation facilitates own action control and, at the same time, imitation boosts social affiliation and rapport with others. It has previously been suggested that basic mechanisms of associative learning can account for behavioural effects of imitation whereas a possible role of associative learning for affiliative processes is poorly understood at present. Therefore, this study examined whether contingency and contiguity, the principles of associative learning, affect also the social effects of imitation. Two experiments yielded evidence in favour of this hypothesis by showing more social affiliation in conditions with high contingency (as compared to low contingency) and in conditions of high contiguity (compared to low contiguity). Sensory stimuli resulting from one's own actions are perceptually attenuated compared to identical but externally produced stimuli. This may enable the organism to discriminate between self-produced events and externally produced events, suggesting a strong link between sensory attenuation and a subjective sense of agency. To investigate this supposed link, we compared the influence of filled and unfilled action-effect delays on both, judgements of agency for self-produced sounds and attenuation of the event-related potential (ERP). In line with previous findings, judgments of agency differed between both delay conditions with higher ratings for filled than for unfilled delays. Sensory attenuation, however, was not influenced by filling the delay. These findings indicate a partial dissociation of the two phenomena. Humans typically act to cause effects in their environment, but at times they also voluntarily omit an action to cause a predictable effect. These effects may become bound to the causing non-actions, just as actions and their effects can become associated. In three experiments, we provide a critical re-assessment of previous reports of non-action effect binding. Following this work, participants completed an acquisition phase to associate actions and non-actions with particular effects. In a subsequent test phase, the former effects were presented as stimuli and participants were allowed to choose an action or non-action freely as a response. Binding should lead to more effect-consistent choices than chance would predict. Previous studies, however, did not control for deliberate strategies of participants that might inflate the consistency bias and, also, did not address overall preferences for either acting or non-acting, which might introduce additional artifacts. We show that these confounds have a strong impact in common experimental designs and introduce ways to mitigate these effects. This improved assessment still corroborated evidence of binding between non-actions and their effects. Patient studies provide insights into mechanisms underlying diseases and thus represent a cornerstone of clinical research. In this study, we report evidence that differences between patients and controls might partly be based on expectations generated by the patients� knowledge of being invited and treated as a patient: the Being a Patient effect (BP effect). This finding extends previous neuropsychological reports on diagnosis threat. Participants with mild allergies were addressed either as patients or control subjects in a clinical study. We measured the impact of this group labeling and corresponding instructions on pain perception and cognitive performance. Our results provide evidence that the BP effect can indeed affect physiological and cognitive measures in clinical settings. Importantly, these effects can lead to systematic overestimation of genuine disease effects and should be taken into account when disease effects are investigated. Finally, we propose strategies to avoid or minimize this critical confound. Research on stimulus-response (S-R) associations as the basis of behavioral automaticity has a long history. Traditionally, it was assumed that S-R associations are formed as a consequence of the (repeated) co-occurrence of stimulus and response, that is, when participants act upon stimuli. Here, we demonstrate that S-R associations can also be established in the absence of action. In an item-specific priming paradigm, participants either classified everyday objects by performing a left or right key press (task-set execution) or they were verbally presented with information regarding an object�s class and associated action while they passively viewed the object (verbal coding). Both S-R associations created by task-set execution and by verbal coding led to the later retrieval of both the Stimulus-Action (S-A) component and the Stimulus-Classification (S-C) component of S-R associations. Furthermore, our data indicate that both associations created by execution and by verbal coding are temporally stable and rather resilient against overwriting. The automaticity of S-R associations formed in the absence of action reveals the striking adaptability of human action control. Motor actions are facilitated if they are foreseeably being imitated rather than counter-imitated by social partners. Such beneficial effects of anticipated imitation have been explained in terms of compatibility between own actions and their anticipated consequences. Previous demonstrations of these effects might alternatively be explained by consistently faster partner responses for imitative than for non-imitative actions, however. This study contrasts both explanations by using virtual co-actors to disentangle the contributions of anticipated action-effect compatibility and anticipated action-effect delay. The data of two experiments support previous theoretical assumptions by showing that the effects of anticipated imitation are indeed driven by compatibility rather than delay. When observing another agent performing simple actions, these actions are systematically remembered as one�s own after a brief period of time. Such �observation inflation� has been documented as a robust phenomenon in studies in which participants passively observed videotaped actions. Whether observation inflation also holds for direct, face-to-face interactions is an open question that we addressed in two experiments. In Experiment 1, participants commanded the experimenter to carry out certain actions, and they indeed reported false memories of self-performance in a later memory test. The effect size of this inflation effect was similar to passive observation as confirmed by Experiment 2. These findings suggest that observation inflation might affect action memory in a broad range of real-world interactions. The feeling of being watched has several well-documented consequences, from social facilitation to the induction of pro-social behavior. Even though the effects of being watched have long been in the focus of scientific interest, it remains unclear which features determine the actual subjective feeling of being watched. We report two experiments to approach this question. Participants were confronted with pictures showing the faces of different creatures while imagining being in an embarrassing situation. Participants rated for each creature in each situation how strongly they felt watched and how much ability they ascribed to the creature to reflect on the situation. A between-experiment manipulation of how much ability was ascribed to a particular creature further probed for a causal relation between the two variables. Results confirmed that the creature�s ascribed ability to reflect on the situation is a key component that determines the feeling of being watched in humans. Classic findings on conformity and obedience document a strong and automatic drive of human agents to follow any type of rule or social norm. At the same time, most individuals tend to violate rules on occasion, and such deliberate rule violations have recently been shown to yield cognitive conflict for the rule-breaker. These findings indicate persistent difficulty to suppress the rule representation, even though rule violations were studied in a controlled experimental setting with neither gains nor possible sanctions for violators. In the current study, we validate these findings by showing that convicted criminals, i.e., individuals with a history of habitual and severe forms of rule-violations, can free themselves from such cognitive conflict in a similarly controlled laboratory task. These findings support a novel view that aims at understanding rule violations from the perspective of the violating agent rather than from the outside observer. While ideomotor approaches to action control emphasize the importance of sensory action effects for action selection, motivational approaches emphasize the role of affective action effects. We used a game-like experimental setup to directly compare the role of sensory and affective action effects in selecting and performing reaching actions in forced- and free-choice tasks. The two kinds of action effects did not interact. Action selection and execution in the forced-choice task was strongly impacted by the spatial compatibility between actions and expected sensory action effects, while the free-choice task was hardly affected. In contrast, action execution, but not selection, in both tasks was strongly impacted by the spatial compatibility between actions and highly-valued action effects. This pattern suggests that sensory and affective action effects serve different purposes: the former seem to dominate rule-based action selection while the latter might serve to reduce remaining action uncertainty. Dishonest responding is an important part of the behavioral repertoire and perfectly integrated in communication and daily actions. Previous research thus aimed at uncovering the cognitive mechanisms underlying dishonest responding by studying its immediate behavioral effects. A comprehensive account of the aftereffects of this type of behavior has not been presented to date, however. Based on methods and theories from research on task switching, we therefore explored the notion of honest and dishonest responding as two distinct intentional sets. In four experiments, participants responded either honestly or dishonestly to simple yes/no questions. Crucially, robust switch costs were found between honest and dishonest responding when questions succeeded promptly (Exp. 1) but also when an unrelated task intervened between questions (Exp. 2). Surprisingly, responding dishonestly to a question also affected responses in the subsequent intervening task in terms of a more liberal response criterion. Time to prepare for the upcoming intentional set further induced asymmetrical switch costs (Exp. 3). Finally, a novel control condition (Exp. 4) allowed us to pinpoint most of the observed effects to negation processing as an inherent mechanism of dishonesty. The experiments shed new light on the cognitive mechanisms underlying dishonesty by providing strong support for the concept of distinct mental sets for honest and dishonest responding. The experiments further reveal that these mental sets are notably stable and are not disturbed by intervening task performance. . The observed aftereffects of dishonest responding might also provide a potent extension to applied protocols for lie detection. The cognitive processes underlying dishonesty, especially the inhibition of automatic honest response tendencies, are reflected in response times and other behavioral measures. Here we suggest that explicit false alibis might have a considerable impact on these cognitive operations. We tested this hypothesis in a controlled experimental setup. Participants first performed several tasks in a pre-experimental mission (akin to common mock crime procedures) and received a false alibi afterward. The false alibi stated alternative actions that the participants had to pretend to have performed instead of the actually performed actions. In a computer-based inquiry, the false alibi did not only reduce, but it even reversed the typical behavioral effects of dishonesty on response initiation (Exp. 1) and response execution (Exp. 2). Follow-up investigations of response activation via distractor stimuli suggest that false alibis automatize either dishonest response retrieval, the inhibition of the honest response, or both (Exp. 3 and 4). This profound impact suggests that false alibis can override actually performed activities entirely and, thus, documents a severe limitation for cognitive approaches to lie detection. Conflict adaptation in masked priming has recently been proposed to rely not on successful conflict resolution but rather on conflict experience (Desender, Van Opstal, & Van den Bussche 2014). We re-assessed this proposal in a direct replication and also tested a potential confound due to conflict strength. The data supported this alternative view, but also failed to replicate basic conflict adaptation effects of the original study despite considerable power. Upcoming responses in the second of two subsequently performed tasks can speed up compatible responses in the temporally preceding first task. Two experiments extend previous demonstration of such backward compatibility to affective features: Responses to affective stimuli were faster in Task 1 when an affectively compatible response effect was anticipated for Task 2. This emotional backward compatibility effect demonstrates that representations of the affective consequences of the Task-2 response were activated before the selection of a response in Task 1 was completed. This finding is problematic for the assumption of a serial stimulus-response translation stage. It also shows that the affective consequence of a response is anticipated during, and has an impact on stimulus-response translation, which implies that action planning considers codes representing and predicting the emotional consequences of actions. Implications for the control of emotional actions are discussed. Task-irrelevant features of a stimulus can disturb performance on a given task, and this can occur for cognitive reasons such as irrelevant stimulus position, and affective reasons such as high stimulus valence. The human brain adapts to such disturbances in order to ensure successful task performance. Adaptations can occur in a transient manner in response to recent events, and they can also be sustained to account for overall probabilities of disturbances. Here, we study the mutual interplay between affective and cognitive task disturbances under conditions of sustained conflict adaptation. More precisely, we examined the trajectory of finger movements in a speeded classification task and investigated whether adaptation to a high probability of spatial disturbances transfers to the impact of affective disturbances (Experiment 1) and whether adaptation to a high probability of affective disturbances transfers to the impact of spatial disturbances (Experiment 2). Our observations point toward an asymmetric transfer from adaptation to affective onto the processing of cognitive disturbances, but not the other way around. Most of our daily life is organized around rules and social norms. But what makes rules so special? And what if one were to break a rule intentionally? Can we simply free us from the present set of rules or do we automatically adhere to them? How do rule violations influence subsequent behavior? To investigate the effects and aftereffects of violating simple S-R rule, we conducted three experiments that investigated continuous finger tracking responses on an iPad. Our experiments show that rule violations are distinct from rule-based actions in both, response times and movement trajectories. Data not only shows differences between the two types of response (rule-based vs. violation), but also yielded an unexpected pattern of aftereffects in case of rule-violations. This allows for a first step at understanding the signature and underlying mechanisms of deliberate rule violations. 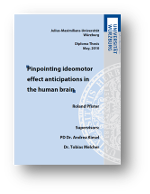 Empirical investigations of ideomotor effect anticipations have mainly used action effects in the environment. By contrast, action effects that apply to the agent�s body have rarely been put to the test in corresponding experimental paradigms. We present a series of experiments using the response-effect compatibility paradigm, in which we studied the impact of to-be-produced tactile action effects on action selection, initiation and execution. Results showed a robust and reliable impact if these tactile action effects were rendered task-relevant (Exp. 1) but not when they were task-irrelevant (Exp. 2a and 2b). We further show that anticipations of tactile action effects follow the same time-course as anticipations of environment-related effects (Exp. 3 and 4). These findings demonstrate that body-related action effects do affect action control much like environment-related effects, and therefore support the theoretical assumption of functional equivalence of any type of action effect. Traditional research on action control focuses on the outcome of a decision process and neglects the way by which these decisions are put into action. Here, we provide direct evidence for ongoing control of motivational impulses during post-decision action execution. Using a movement task in which gain/loss stimuli either functioned as targets or distractors, we show that different phases of a movement are distinctly shaped by motivational impulses. Response initiation times revealed control costs for loss targets and distractors, and control benefits for gain targets. However, movement trajectories revealed strong attraction towards the gain distractor, in line with a hypothesized pull of approach-related stimuli, while targets and distractors associated with losses had no repulsive avoidance-related effect on movement trajectories. These results show that motivational processing of goal-relevant stimuli influences the way in which goal-directed actions are executed and highlight a prominent role of reward-related distractors in shaping movement execution. Expectancy effects are a wide-spread phenomenon, and they come with a lasting influence on cognitive operations, from basic stimulus processing to higher cognitive functions. Their impact is often profound and behaviorally significant as evidenced by an enormous body of literature investigating the characteristics and possible processes underlying expectancy effects. The literature on this topic spans diverse fields, from clinical psychology over cognitive neuroscience, and social psychology to behavioral biology. Here, we present an emerging perspective on these diverse phenomena and show how this perspective stimulates new toeholds for investigation, provides insight in underlying mechanisms, improves awareness of methodological confounds, and can lead to a deeper understanding of the effects of expectations on a broad spectrum of cognitive processes. Cognitive conflicts and distractions by task-irrelevant information often counteract effective and goal-directed behaviors. In some cases, conflicting information can even emerge internally, thus without direct external reference, and as a result of automatic mental activations. For instance, during number processing, magnitude information automatically elicits spatial associations resembling a mental number line. This Spatial-Numerical Association of Response Codes (SNARC) effect can modulate cognitive-behavioral performance but is also highly flexible and context-dependent, which points towards a critical involvement of working memory functions. Transcranial direct current stimulation (tDCS) to the prefrontal cortex (PFC), in turn, has been effective in modulating working memory-related cognitive performance. In a series of experiments, we here demonstrate that decreasing activity of the left PFC by cathodal tDCS consistently and specifically eliminates implicit cognitive conflicts based on the SNARC effect, but explicit conflicts based on visuo-spatial distraction remain unaffected. This dissociation is polarity-specific and appears unrelated to functional magnitude processing as classified by regular numerical distance effects. These data demonstrate a causal involvement of the left PFC in implicit cognitive conflicts based on the automatic activation of spatial-numerical processing. Corroborating the critical interaction of brain stimulation and neurocognitive functions, our findings suggest that distraction from goal-directed behavior by automatic activation of implicit, task-irrelevant information can be blocked by the inhibition of prefrontal activity. Humans follow rules by default, and violating even simple rules induces cognitive conflict for the rule breaker. Previous studies revealed this conflict in various behavioral measures, including response times and movement trajectories. Based on these experiments, we investigated the electrophysiological signature of deliberately violating a simple stimulus-response mapping rule. Such rule violations were characterized by a delayed and attenuated P300 component when evaluating a rule-relevant stimulus, most likely reflecting increased response complexity. This parietal attenuation was followed by a frontal positivity for rule violations relative to correct response trials. Together, these results reinforce previous findings on the need to inhibit automatic S-R translation when committing a rule violation, and they point toward additional factors involved in rule violation. Candidate processes such as negative emotional responses and increased monitoring should be targeted by future investigations. The schoRsch package aims at improving the usability of the open-source software R for researchers in psychology and related disciplines. It provides easy-to-use functions to format the results of typical tests used in psychology and related fields according to the current style guidelines of the American Psychological Association (APA). These and several other convenience functions allow for efficient data analysis and aim at expediting the workflow when reporting test results in scientific publications. Short-term bindings between responses and events in the environment ensure efficient behavioral control. This notion holds true for two particular types of binding: Bindings between responses and response-irrelevant distractor stimuli that are present at the time of responding, and also for bindings between responses and the effects they cause. Although both types of binding have been extensively studied in the past, little is known about their interrelation. In three experiments, we analyzed both types of binding processes in a distractor-response binding design and in a response-effect binding design, which yielded two central findings. (1) Distractor-response binding and response-effect binding effects were observed not only in their native, but also in the corresponding �non-native� design, and (2) a manipulation of retrieval delay affected both types of bindings in a similar way. We suggest that a general and unselective mechanism is responsible for integrating own responses with a large variety of stimuli. Human action control is influenced by bindings between perceived stimuli and responses carried out in their presence. Notably, responses given to a target stimulus can also be integrated with additional response irrelevant distractor stimuli that accompany the target (distractor-response binding). Subsequently re-encountering such a distractor then retrieves the associated response. Although a large body of evidence supports the existence of this effect, the specific structure of distractor-response bindings is still unclear. Here we test the predictions derived from two possible assumptions about the structure of bindings between distractors and responses. According to a configural approach, the entire distractor-object is integrated with a response, and only upon repetition of the entire distractor-object the associated response would be retrieved. According to an elemental approach, one would predict integration of individual distractor features with the response and retrieval due to the repetition of an individual distractor feature. Four experiments indicate that both, configural and elemental bindings exist and specify boundary conditions for each type of binding. These findings provide detailed insights into the architecture of bindings between response-irrelevant stimuli and actions and thus allow for specifying how distractor stimuli influence human behavior. The temporal interval between an action and its ensuing effect is perceptually compressed. Specifically, the perceived onset of actions is shifted towards their effects in time and, vice versa, the perceived onset of effects is shifted towards their causing actions. In four experiments, we report evidence showing that action-effect binding also occurs in the spatial domain. Participants controlled the location of a visual stimulus by performing stylus movements before they judged either the position of the stylus or the position of the visual stimulus. The results yielded spatial binding between the perceived stylus position and the perceived stimulus position when the stimulus was under full control of the hand movement compared to control conditions without direct control. Ample evidence suggests that motor actions are generated by mentally recollecting their sensory consequences, i.e., via effect anticipations. There is less evidence, though, on the capacity-limitations that such effect anticipations suffer from. In the present paper we aim to overcome shortcomings of previous research on this issue by extending the set of empirical indicators of effect-anticipations and by using trial-wise instead of block-wise manipulations. In four experiments using the locus of slack- and the effect propagation-logic, we found conclusive evidence for effect anticipation taking place in the capacity-limited central bottleneck. These findings extend previous research suggesting an overlap of a �response selection� process as assumed in traditional stage theory and effect anticipation processes as assumed in effect-based ideomotor models of action control. Converging evidence from controlled experiments suggests that the mere processing of a number and its attributes such as value or parity might affect free choice decisions between different actions. For example the Spatial Numerical Associations of Response Codes (SNARC) effect indicates the magnitude of a digit to be associated with a spatial representation and might therefore affect spatial response choices (i.e., decisions between a �left� and a �right� option). At the same time, other (linguistic) features of a number such as parity are embedded into space and might likewise prime left or right responses through feature words (odd or even, respectively; MARC effect). In this experiment we aimed at documenting such influences in a natural setting. We therefore assessed number-space and parity-space association effects by exposing participants to a fair distribution task in a card playing scenario. Participants drew cards, read out loud their number values, and announced their response choice, i.e., dealing it to a left versus right player, indicated by Playmobil characters. Not only did participants prefer to deal more cards to the right player, the card�s digits also affected29 response choices and led to a slightly but systematically unfair distribution, supported by a regular SNARC effect and counteracted by a reversed MARC effect. The experiment demonstrates the impact of SNARC- and MARC-like biases in free choice behavior through verbal and visual numerical information processing even in a setting with high external validity. The present work investigated functional characteristics of control adjustments in intermodal sensory processing. 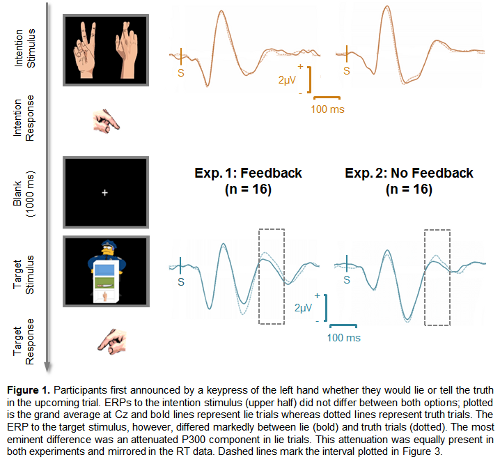 Subjects performed an interference task that involved simultaneously presented visual and auditory stimuli which were either congruent or incongruent with respect to their response mappings. In two experiments, �trial-by-trial� sequential congruency effects were analysed for specific conditions that allowed ruling out �non-executive� contributions of stimulus or response priming to the respective RT fluctuations. In Experiment 1, conflict adaptation was observed in an oddball condition in which interference emanates from a task-irrelevant and response-neutral low-frequency stimulus. This finding characterizes intermodal control adjustments to be based � at least partly � on increased sensory selectivity, which is able to improve performance in any kind of interference condition which shares the same or overlapping attentional requirements. In order to further specify this attentional mechanism, Experiment 2 defined analogous conflict adaptation effects in non-interference unimodal trials in which just one of the two stimulus modalities was presented. Conflict adaptation effects in unimodal trials exclusively occurred for unimodal task-switch trials but not for otherwise equivalent task repetition trials, which suggests that the observed conflict-triggered control adjustments mainly consist of increased distractor inhibition (i.e., down-regulation of task-irrelevant information), while attributing a negligible role to target amplification (i.e., enhancement of task-relevant information) in this setup. This behavioral study yields a promising operational basis for subsequent neuroimaging investigations to define brain activations and connectivities which underlie the adaptive control of attentional selection. The response-effect compatibility (REC) paradigm provides an elegant tool to study the impact of anticipated action effects on action control. Converging evidence for such anticipative processes has mainly emerged from tasks that require simple, discrete actions, whereas tasks that require more complex, continuous actions such as wheel-rotation responses have yielded discrepant results. We propose that these discrepant results can be explained by two moderating variables that have only played a minor role in effect-based theories of human action control: (1) the degree of dimensional overlap (rather than its mere presence) and (2) directing attention towards the action effects. The results of three experiments suggest that both factors are crucial in determining the size of REC effects for continuous wheel-rotation responses: Reliable REC effects were obtained, and they were larger with high than with low dimensional overlap and when attending to the effects than when not. Thus, the study points toward important preconditions that determine whether and how effect anticipations affect complex motor actions. Janczyk, M., & Pfister, R. (2015). Von der Basis zur Anwendung: Kognitionspsychologie und ihre Bedeutung f�r den Alltag. Teil 2: Lernen und Ged�chtnis. In-Mind Magazine, 4. Begriffe wie �kognitiv� oder �Kognition� sind heutzutage aus dem Wortschatz der wissenschaftlichen Psychologie und vieler angrenzender Bereiche nicht mehr wegzudenken und auch die Alltagssprache hat das Wort inzwischen erobert, etwa in Form von �kognitiven Trainings�, �kognitivem Altern� oder �kognitiven Therapien�. Anticipations of future sensory events have the potential of priming motor actions that would typically cause these events. Such effect anticipations are generally assumed to rely on previous physical experiences of the contingency of own actions and their ensuing effects. Here we propose that merely imagined action effects may influence behaviour similarly as physically experienced action effects do. Three experiments in the response-effect compatibility paradigm show that the mere knowledge of action-effect contingencies is indeed sufficient to incorporate these effects into action control even if the effects are never experienced as causally linked to own actions. The experiments further highlight constraints for this mechanism which seems to be rather effortful and to depend on explicit intentions. The subjective experience of controlling events in the environment alters the perception of these events. For instance, the interval between one�s own actions and their consequences is subjectively compressed � a phenomenon known as intentional binding. In two experiments, we studied intentional binding in a social setting in which actions of one agent prompted a second agent to perform another action. Participants worked in pairs and were assigned to a �leader� and a �follower� role, respectively. The leader�s key presses triggered (after a variable interval) a tone effect and this tone served as go signal for the follower to perform a keypress as well. Leaders and followers estimated the interval between the leader�s keypress and the following tone, or the interval between the tone and the follower�s keypress. The leader showed reliable intentional binding for both intervals relative to the follower�s estimates. These results indicate that human agents experience a pre-reflective sense of agency for genuinely social consequences of their actions. How does our mind produce physical, goal-directed action of our body? For about 200 years, philosophers and psychologists hypothesized the transformation from mind to body to rely on the anticipation of an action�s sensory consequences. Whereas this hypothesis received tremendous support from behavioral experiments, the neural underpinnings of action control via such ideomotor effect anticipations are virtually unknown. Using functional magnetic resonance imaging, the present study identified the inferior parietal cortex and the parahippocampal gyrus as key regions for this type of action control � setting the stage for a neuroscientific framework for explaining action control by ideomotor effect anticipations and thus enabling a synthesis of psychological and neuroscientific approaches to human action. What we intend to achieve with our actions affects the way we move our body. This has been repeatedly shown for both, movement-related intentions such as grasping and turning an object, and relatively high-level intentions such as the intention to collaborate or to compete with a social partner. The impact of an intermediate level of intentions � referring to action-contingent changes in the physical environment � is far less clear, however. We present three experiments that aim at scrutinizing this level of analysis by showing how such anticipated consequences affect movement trajectories. Participants steered a virtual avatar towards portals that displaced the avatar to a different but predictable location. Even though this displacement occurred only after the movement was completed, hand movements were clearly torn toward the anticipated final location of the avatar. These results show that properties of anticipated action consequences leave a fingerprint on movement trajectories and provide an opportunity to unite previous accounts on the relation of intentions and movements with general frameworks of action planning. Previous research suggests that motor actions are intentionally generated by recollecting their sensory consequences. Whereas this has been shown to apply to visual or auditory consequences in the environment, surprisingly little is known about the contribution of immediate, body-related consequences, such as proprioceptive and tactile reafferences. Here we report evidence for a contribution of vibrotactile reafferences to action selection by using a response-effect compatibility paradigm. More precisely, anticipating actions to cause spatially incompatible vibrations delayed responding to a small but reliable degree. Whereas this observation suggests functional equivalence of body-related and environment-related reafferences to action control, the future application of the described experimental procedure might reveal functional peculiarities of specific types of sensory consequences in action control. Even though electroencephalography has played a prominent role for lie detection via personally relevant information, the electrophysiological signature of active lying is still elusive. We addressed this signature with two experiments in which participants helped a virtual police officer to locate a knife. Crucially, before this response, they announced whether they would lie or tell the truth about the knife�s location. This setup allowed us to study the signature of lie-telling in the absence of rare and personally significant oddball stimuli that are typically used for lie detection via electrophysiological markers, especially the P300 component. Our results indicate that active lying attenuated P300 amplitudes as well as N200 amplitudes for such non-oddball stimuli. These results support accounts that stress the increased cognitive demand of lie-telling, including the need to suppress the truthful response and to generate a lie. When performing jointly on a task, human agents are assumed to represent their coactor�s share of this task, and research in various joint action paradigms has focused on representing the coactor�s stimulus�response assignments. Here we show that the response�effect (R�E) contingencies exploited by a coactor also affect performance, and thus might be represented as if they were used by oneself. Participants performed an R�E compatibility task, with keypresses producing spatially compatible or incompatible action effects. We did not observe any R�E compatibility effects when the task was performed in isolation (individual go�no-go). By contrast, small but reliable R�E compatibility effects emerged when the same task was performed in a joint setting. These results indicate that the knowledge of a coactor�s R�E contingencies can influence whether self-produced action effects are used for one�s own motor control. Psychological research has documented again and again marked performance decrements whenever humans perform 2 or more tasks at the same time. In fact, the available evidence seems to suggest that any type of behavior is subject to such limitations. The present experiments employed the psychological refractory period (PRP) paradigm to identify a clear exception to this rule: Unconditioned reflexes do escape dual-task interference, whereas intended simple responses, so called �prepared reflexes,� do not. Beyond this empirical novelty, we discuss the findings in broader terms of human action control. In particular, we suggest that the (non)susceptibility to dual-task interference may provide a clear empirical delineation between goal-directed behavior (i.e., actions) and other, not goal-directed behavior. Responses in the second of two subsequently performed tasks can speed up compatible responses in the temporally preceding first task. Such backward crosstalk effects (BCE) represent a challenge to the assumption of serial processing in stage models of human information processing, because they indicate that certain features of the second response have to be represented before the first response is emitted. Which of these features are actually relevant for BCEs is an open question, even though identifying these features is important for understanding the nature of parallel and serial response selection processes in dual-task performance. Motivated by effect-based models of action control, we show in three experiments that the BCE to a considerable degree reflects features of intended action effects, although features of the response proper (or response-associated kinesthetic feedback) also seem to play a role. These findings suggest that the codes of action effects (or action goals) can become activated simultaneously rather than serially, thereby creating BCEs. Janczyk, M., & Pfister, R. (2014). Von der Basis zur Anwendung: Kognitionspsychologie und ihre Bedeutung f�r den Alltag. Teil 1: Wahrnehmung und Handlung. In-Mind Magazine, 2. This study examined the dynamic impact of self-control conflict on action execution. We reasoned that the tug-of-war between antagonistic action tendencies is not ultimately solved before movement initiation but leaks into action execution. To this end, we measured mouse trajectories to quantify the dynamic competition between initial temptations and the struggle to overcome them. Participants moved the mouse cursor from a start location to one of two targets. Each target represented gains or losses of points. Although participants earned points in the majority of the trials, they also had to make movements to the loss target in some trials to prevent an even higher loss. Two experiments found that movement trajectories in these loss trials deviate towards the tempting stimulus: The way we move reveals self-control conflicts that have not been resolved prior to action execution. We examined whether a temporal interval between an action and its sensory effect is integrated in the cognitive action structure in a bidirectional fashion. In three experiments, participants first experienced that actions produced specific acoustic effects (high and low tones) which occurred temporally delayed after their actions. In a following test phase, the tones that were presented as action effects in the previous phase were now presented as primes for the responses that had caused them previously and, critically, also as primes for the interval that previously separated action and effects. The tones were presented as go-signals in a free-choice test and as response-imperative stimuli in a forced-choice test. In the free choice test, participants were more likely to choose responses consistent with the previous pairing, but these responses were initiated slower than responses that were inconsistent with previous action-effect learning (Experiment 1). Effect-consistent responses were also initiated slower in the speeded forced-choice test (Experiment 2). These observations suggest that retrieval of a long action-effect interval slows down response initiation. In Experiment 3, response-contingent effects were presented with a long or short delay after a response. Reaction times in both, a forced-choice and free-choice setup, were faster in the short than in the long interval condition. We conclude that temporal information about the interval between actions and effects is integrated into a cognitive action structure and is automatically retrieved during response selection. Research on human action has extensively covered controlled and automatic processes in the transformation of stimulus information into motor action, and how conflict between both types of processes is solved. However, the question of how automatic S-R translation per se depends on top-down control states remains unanswered. The present study addressed this issue by manipulating top-down control state (instructed S-R mapping) and automatic bottom-up processing (retrieval of S-R memory traces) independently from each other. Using a color/shape task-switching paradigm, we compared cross-talk triggered by distractor stimuli, for which the instructed S-R mapping and the S-R associations compiled at the beginning of the experiment matched, with the cross-talk triggered by distractor stimuli, for which (re-)instructed mapping and compiled S-R associations did not match. We show that the latter distractors do not yield any cross-talk in RTs and even reversed cross-talk in error rates, demonstrating that automatic S-R retrieval is modulated by top-down control states. The bimodality coefficient (BC) is a statistic to probe empirical distributions for uni- versus bimodality. Its use has become increasingly popular with rising interest in distinguishing single-process and dual-process phenomena in a wide variety of cognitive processes. However, different formulas for the BC have appeared in the literature since its first appearance in the repertoire of the SAS package. The present article identifies these discrepancies, discusses an important but undesired behavior of the BC, and offers guidelines on how to appropriately calculate the BC values with different software packages (SAS, Calc, Excel, SPSS, Matlab, R). Pfister, R., Schwarz, K. A., Carson, R., & Janczyk, M. (2013). Easy methods for extracting individual regression slopes: Comparing SPSS, R, and Excel. Tutorials in Quantitative Methods for Psychology, 9(2), 72-78. Three different methods for extracting coefficients of linear regression analyses are presented. The focus is on automatic and easy-to-use approaches for common statistical packages: SPSS, R, and MS Excel / Libre Office Calc. Hands-on examples are included for each analysis, followed by a brief description of how a subsequent regression coefficient analysis is performed. Numbers and space are tightly linked � a phenomenon that is referred to as the SNARC effect (spatial-numerical association of response codes). The present study investigates how quickly and flexibly the behavioral impact of such spatial-numerical associations can be controlled. Participants performed a parity judgment task and we examined how the SNARC effect is influenced by the preceding congruency between the required response and the target number�s spatial association. Results indicate that the SNARC effect is reduced instantly after having experienced a number�s spatial association to interfere with responding. This sequential modulation indicates a pronounced flexibility of spatial-numerical associations driven by cognitive control mechanisms. Erratum available as supplementary material (as printed in Journal of Experimental Psychology: Learning, Memory, and Cognition, 39(6), 1913). Voluntary actions are guided by sensory anticipations of body-related as well as environment-related action effects. Even though action effects in the environment typically resemble the action goal proper, anticipations of body-related effects can cause interference if they do not correspond to intended environment-related effects. The present study explored which specific response features, namely, the spatial location of the moving limb or its anatomical connection to the body causes such interference. Using a response-effect (R-E) compatibility design with normal and crossed hand-key mappings, we show that environment-related effects are predominantly related to spatial rather than anatomical response features, ensuring that goal-directed behavior is flexible and efficient at the same time. Furthermore, results indicate that this mechanism applies to both, free- and forced-choice actions. Over the last decade, experimental findings from a variety of paradigms and fields have given rise to a renaissance of the Ideomotor Approach - an elegant theory of voluntary action that was first described by 19th century philosophers. This classical theory as well as its modern extensions put special emphasis on the role of action effects and anticipative processes for action control. While there is growing consensus on the importance of these phenomena, we are just now beginning to understand the integrative power of the ideomotor approach in a variety of fields such as perception and action, imitation, tool-use, and cognitive neuroscience. This Research Topic is devoted to such emerging perspectives on ideomotor action - ranging from neural correlates up to social behaviour. Ideomotor theory holds that the perception or anticipatory imagination of action effects activates motor tendencies towards the action that is known to produce these effects, here referred to as ideomotor response activation (IRA). IRA presupposes that the agent has previously learned which action produces which effects, and that this learning process has created bidirectional associations between the sensory effect codes and the motor codes producing the sensory effects. Here, we refer to this process as ideomotor learning. In the presented fMRI study, we adopted a standard two-phase ideomotor learning paradigm; a mixed between/within-subjects design allowed us to assess the neural substrate of both, IRA and ideomotor learning. We replicated earlier findings of a hand asymmetry in ideomotor processing with significantly stronger IRA by left-hand than right-hand action effects. Crucially, we traced this effect back to more pronounced associative learning for action-contingent effects of the left hand compared with effects of the right hand. In this context, our findings point to the caudate nucleus and the angular gyrus as central structures of the neural network underlying ideomotor learning. Human-computer interactions pose special demands on the motor system, especially regarding the abstract, virtual tool transformations that underlie typical mouse movements. Three experiments investigated whether such virtually tool-transformed movements are similarly resistant to irrelevant variation of a target object as skilled natural movements are. We show that such irrelevant information deteriorates performance in perceptual tasks whereas movement parameters remain unaffected, suggesting that the control of virtual tools draws on the same mechanisms as natural actions. The results are discussed in terms of their practical utility and recent findings investigating unskilled and transformed movements in the framework of the action/perception model and the integration of tools in to the body-schema. Humans make numerous choices every day and tend to perceive these choices as free. The present study shows how simple free choices are biased by experiencing unrelated auditory information. In two experiments, participants categorized tones according to their intensity on the dimensions volume and duration on the majority of trials. On some trials, however, they were to randomly generate a number, and we found these choices to be influenced by tone intensity. Particularly, if participants were cued toward volume, loud tones clearly biased participants to generate larger numbers. For tone duration, a similar effect only emerged if spatial information was reinforced by the motor context of the task. The findings extend previous findings relating to the ATOM framework (A Theory of Magnitude) by an explicit focus on auditory magnitude processing. As such, they also constrain ATOM by showing that the connections between different magnitude dimensions vary to a considerable degree. A commentary on Honesty requires time (and lack of justifications) by Shalvi, S., Eldar, O., & Bereby-Meyer, Y. (2012). Psychological Science, 23(10), 1264�1270. doi: 10.1177/0956797612443835. One�s own name constitutes a unique part of conscious awareness � but does this also hold true for unconscious processing? The present study shows that the own name has the power to bias a person�s actions unconsciously even in conditions that render any other name ineffective. Participants judged whether a letter string on the screen was a name or a non-word while this target stimulus was preceded by a masked prime stimulus. Crucially, the participant�s own name was among these prime stimuli and facilitated reactions to following name targets whereas the name of another, yoked participant did not. Yet, participants were not aware of any of the prime stimuli, including their own name. These results extend traditional findings on �breakthrough� phenomena of personally relevant stimuli to the domain of unconscious processing. Thus, the brain seems to possess adroit mechanisms to identify and process such stimuli even in the absence of conscious awareness. Human actions are guided either by endogenous action plans or by external stimuli in the environment. These two types of action control seem to be mediated by neurophysiologically and functionally distinct systems that interfere if an endogenously planned action suddenly has to be performed in response to an exogenous stimulus. In this case, the endogenous representation has to be deactivated first to give way to the exogenous system. Here we show that interference of endogenous and exogenous action control is not limited to motor-related aspects but also affects the perception of action-related stimuli. Participants associated two actions with contingent sensory effects in learning blocks. In subsequent test blocks, preparing one of these actions specifically impaired responding to the associated effect in an exogenous speeded detection task, yielding a blindness-like effect for arbitrary, learned action effects. In accordance with the Theory of Event Coding, this finding suggests that action planning influences perception even in the absence of any physical similarities between action and to-be-perceived stimuli. Transformations of hand movements by tools such as levers or electronic input devices can invoke performance costs compared to untransformed movements. The present study investigated at which stage of information processing such tool-transformation costs arise by means of the Psychological Refractory Period paradigm. We used an inversion transformation, i.e., the movement of the operating hand was transformed into a spatially incompatible movement of a lever. As a basic tool-transformation effect, the initiation of inverted tool movements was delayed compared to non-inverted movements. Experiment 1 suggested a central (or post-central) locus of this tool transformation effect, and ruled out a (pre-central) perceptual locus. Experiments 2 and 3 confirmed the central locus and ruled out a later, motor-related stage of processing. The results show that spatially incompatible tool movements delay a capacity-limited stage of information processing, often referred to as response selection. Using tools, such as simple levers, poses specific demands on the motor system. Two related performance decrements have been reported: The costs that arise when required tool movements and movements of the operating hands are spatially incompatible (hand-tool compatibility), and the costs that arise when relevant stimuli and tool movements are spatially incompatible (stimulus-tool compatibility). We performed two experiments to test the boundary conditions of both effects. Experiment 1 revealed a strong hand-tool compatibility effect despite visual occlusion of the hand and instructions to ignore hand movements. Experiment 2 revealed influences of stimulus-tool compatibility despite instructions to ignore the tool and to pay attention to the operating hand alone. These results suggest that lever movements of the type studied become automatically represented and constrain motor performance. The last decades have seen a growing interest in the impact of action on perception and other concurrent cognitive processes. One particularly interesting example is that manual rotation actions facilitate mental rotation. The present study extends this research in two fundamental ways. First, Experiment 1 demonstrated that not only do manual rotations facilitate mental rotations, but that conversely, mental rotations also facilitate subsequent manual rotations. Second, Experiments 2 and 3 targeted the mechanisms underlying this interplay. Here, manual steering wheel rotations produced salient visual effects, namely the rotation of either a plane or a horizon in a visual aviation display. The rotation direction of these effects either did or did not correspond to the direction of the manual rotation itself. These experiments clearly demonstrate an impact of sensory action effects: Mental rotations facilitate manual rotations with visual effects of the same direction (as the mental rotation), irrespective of the direction of the manual rotation. These findings highlight the importance of effect anticipation in action planning. As such they support the contentions of ideomotor theory and shed new light on the cognitive source of the interplay between visual imagery and motor control. Flexible behavior is only possible if contingencies between own actions and following environmental effects are acquired as quickly as possible; and recent findings indeed point toward an immediate formation of action-effect bindings already after a single coupling of an action and its effect. The present study explored whether these short-term bindings occur for both, stimulus- and goal-driven actions (�forced-choice actions� vs. �free-choice actions�). Two experiments confirmed that immediate action-effect bindings are formed for both types of actions and affect upcoming behavior. These findings support the view that action-effect binding is a ubiquitous phenomenon which occurs for any type of action. Recent studies reported converging evidence for action-effect associations if participants adopted an intention-based action control mode in free choice conditions whereas no evidence for action-effect associations was found when participants adopted a stimulus-based mode in forced choice conditions. It is not yet clear, however, whether action control modes moderate acquisition or usage of action-effect associations. In the present experiment, two groups of participants underwent an acquisition phase consisting of either free or forced choice key presses that produced irrelevant but contingent effect tones. In a subsequent test phase, participants freely chose the key to press after former effect tones were presented. A reliable consistency effect resulted for both groups, i.e. participants preferred the key that produced the irrelevant tone in the preceding acquisition phase. In combination with prior findings, this consistency effect suggests that usage but not acquisition of action-effect associations depends on an intention-based action control mode. Numerous recent studies examined the impact of video gaming on various dependent variables, including the players� affective reactions, positive as well as detrimental cognitive effects, and real-world aggression. These target variables are typically analyzed as a function of game characteristics and player attributes � especially gender. However, findings on the uneven distribution of gaming experience between males and females on the one hand and the effect of gaming experience on several target variables on the other hand point at a possible confound when gaming experiments are analyzed with standard analysis of variance (ANOVA). The present paper uses simulated data to exemplify analysis of regression residuals (ANORES) as a potentially beneficial data analysis strategy for such data sets. As the actual impact of gaming experience on each of the various dependent variables differs, the ultimate benefits of ANORES entirely depend on the research question but it offers a powerful statistical approach to video game research whenever gaming experience is a confounding factor. The wardrobe malfunction � an unanticipated exposure of bodily parts in the public � has become a prevailing issue in concerts, shows and other celebrity events that is reliably reported by the media. The internet as the fastest source for celebrity gossip allows measuring the impact of such wardrobe malfunctions on the public interest in a celebrity. This measurement in turn allows conclusions about intention, motivation, and internet behaviour of a wide variety of internet users. The present study exemplifies the use of an innovative non-reactive measure of active interest � the Search Volume Index � to assess the impact of a variety of internet-related phenomena, including wardrobe malfunctions. Results indicate that interest in a celebrity increases immediately after such an event and stays at a high level for about three weeks (the wardrobe plateau). This special form of celebrity gossip thus meets a constant interest of a substantial proportion of internet users. According to ideomotor theory, voluntary actions are selected and initiated by means of anticipated action effects. Prior experiments yielded evidence for these effect anticipations with response-effect (R-E) compatibility phenomena using blocked R-E relations. Daily actions, however, typically evoke different effects depending on the situational context. In the present study, we accounted for this natural variability and investigated R-E compatibility effects by a trial-by-trial variation of R-E compatibility relations. In line with recent observations regarding ideomotor learning, R-E compatibility influenced responding only when participants responded in free choice trials assuming that participants then adopted an intention-based action control mode. In contrast, R-E compatibility had no impact when participants responded according to imperative stimuli throughout the experiment, thus when participants adopted a stimulus-based action control mode. Interestingly, once an intention-based mode was established because of free choice trials within an experimental block, we observed response compatibility effects in free as well as forced choice trials. These findings extend and refine theoretical assumptions on different action control modes in goal-directed behavior and the specific contribution of ideomotor processes to intention-based action control. Pfister, R., Janczyk, M., & Kunde, W. (2010). Los, beweg dich! � Aber wie? Ideen zur Steuerung menschlicher Handlungen. In-Mind Magazine, 4, available online. Im Alltag ist es die selbstverst�ndlichste aller Selbstverst�ndlichkeiten: Wenn ich in den K�hlschrank greifen m�chte um einen Joghurt herauszuholen, den Briefkasten nach Post durchsuchen will oder auf der Computertastatur herumdr�cke � meine H�nde machen meistens das, was ich von ihnen erwarte. Und bis auf seltene Ausnahmen erreiche ich zumindest in so einfachen F�llen auch das was ich wollte. Aber wie funktioniert das eigentlich? Woher wissen meine H�nde was sie tun sollen? Wie wird mein subjektives Ziel in tats�chliches Verhalten �bersetzt? According to ideomotor theory, actions become linked to the sensory feedback they contingently produce, so that anticipating the feedback automatically evokes the action it typically results from. Numerous recent studies have provided evidence in favour of such action-effect learning but left an important issue unresolved. It remains unspecified to what extent action-effect learning is based on associating effect-representations to representations of the performed movements or to representations of the targets at which the behaviour aimed at. Two experiments were designed to clarify this issue. In an acquisition phase, par-ticipants learned the contingency between key presses and effect tones. In a following test phase, key-effect and movement-effect relations were orthogonally assessed by changing the hand-key mapping for one half of the participants. Experiment 1 showed precedence for target-effect over movement-effect learning in a forced-choice RT task. 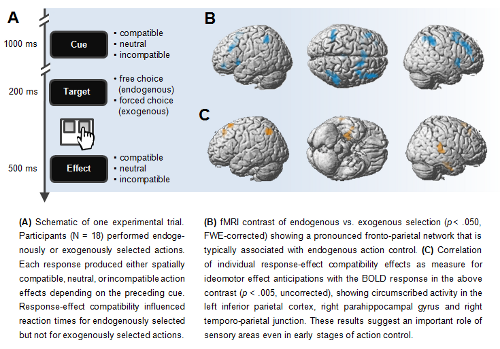 In Experiment 2, target-effect-learning was also shown to influence the outcome of response selection in a free-choice task. Altogether, the data indicate that both, movement-effect as well as target-effect associations contribute to the formation of action-effect linkages � provided that movements and targets are likewise contingently related to the effects. Pfister, R., Foerster, A., Schwarz, K. A., & Wirth, R. (2014). L�sst sich ein guter Hochstapler als solcher entlarven? Wenn ja: Wie? In: W. Schwanebeck (Ed. ), �ber Hochstapelei: Perspektiven auf eine kulturelle Praxis (pp. 63-72). Berlin: Neofelis. Frank William Abagnale Jr. hatte bereits vor seinem zwanzigsten Geburtstag einiges erreicht: Er hatte als Flugzeugpilot gearbeitet, war als Arzt und Jurist t�tig gewesen und hatte zudem als Universit�tsdozent Soziologie unterrichtet. Eine derartige Anzahl von Errungenschaften spricht daf�r, dass der 1948 geborene Abagnale au�erordentlich talentiert sein musste. Und tats�chlich verf�gte er �ber gro�es Talent. Dieses Talent bezog sich allerdings genauso wenig auf das Fliegen von Flugzeugen wie auf das Behandeln von Patienten, das Auslegen von Gesetzestexten, oder das Verstehen soziologischer Zusammenh�nge. Seine wahre Begabung lag vielmehr darin, die Gunst der Stunde zu nutzen und sich mithilfe gef�lschter Zeugnisse und geschickt eingesetzter Improvisationskunst als jemand auszugeben, der er nicht war. Dieses Talent, zusammen mit seiner Gabe f�r das F�lschen von Bankschecks, erm�glichte ihm ein luxuri�ses Leben, das nicht nur gen�gend Stoff f�r autobiographische B�cher lieferte, sondern dem auch in Form des Kinofilmes Catch Me If You Can (USA 2002, R: Steven Spielberg) ein Denkmal gesetzt wurde. Offensichtlich hatte Frank Abagnale es geschafft, sich �ber Jahre hinweg so gekonnt in Szene zu setzen, dass sein gesamtes soziales Umfeld davon get�uscht wurde. Dies ist umso beachtlicher, wenn man sich die Herausforderungen vor Augen f�hrt, denen ein professioneller Hochstapler gegen�ber steht: Er muss nicht nur eine stimmige, glaubhafte und zweckdienliche Geschichte entwerfen, sondern diese immer wieder so �berzeugend wie konsistent darstellen, und dabei auf spontane Nachfragen souver�n reagieren k�nnen, obwohl h�ufig hierzu Wissen vonn�ten ist, das der Hochstapler nicht besitzen kann. Wie die Geschichte von Frank Abagnale eindrucksvoll zeigt, ist allerdings nicht nur die Hochstapelei selbst eine gro�e Herausforderung. Vielmehr scheint auch das Aufdecken von Hochstapelei mit einiger Schwierigkeit verbunden zu sein � ganz unabh�ngig davon, ob es sich um eine ausget�ftelte, erdachte Identit�t handelt, oder stattdessen um eine kleine, wenig weitreichende Prahlerei im Alltag. Mit der Aufdeckung derartiger Falschaussagen bzw. von L�gen im Allgemeinen besch�ftigt sich die psychologische Forschung seit vielen Jahrzehnten � und hat dabei verschiedene bemerkenswerte Ergebnisse erzielt. Einige dieser wegweisenden Forschungsans�tze werden im Folgenden n�her beleuchtet. Pfister, R. (2013). Breaking the rules: Cognitive conflict during deliberate rule violations. PhD thesis, Julius-Maximilians University of W�rzburg, Germany. �I ain't gonna pay no attention to your rules� sings hard-rock legend AC/DC. Violation of rules and social norms is not confined to hard rock musicians, however. Rather, conflict between existing rules and own goals and intentions, is an important daily challenge for human agents. Rule violations obviously can imply consequences and these consequences can be viewed from different perspectives such as moral reasoning, ethical implications and legal consequences. Whereas these perspectives provide elaborate accounts for rule violation behaviour, the cognitive processes during deliberate rule violations have not been investigated systematically to date. As a first step in this direction, I report three experimental series probing for cognitive conflict while violating a rule. These experiments focus specifically on circumscribed motor actions according to arbitrary experimental rules in a setting that does not enforce any sanctions or otherwise negative consequences upon the agent. Even in this controlled setting, rule violations cause measurable cognitive conflict that is evident for responses in choice reaction tasks (Exp. 1-3) as well as for movement trajectories and other features of more complex actions (Exp. 4-6). These experiments also suggest the rule representation to remain continuously active while violating a rule, thus leaving a fingerprint on the agent�s behaviour. By contrast, the representation of the original rule seems to be diminished instantly if equivalent actions are not labelled as rule violations but rather as responses according to an alternative rule specifying the opposite mapping. Finally, deliberate rule violations seem to come with a specific electrophysiological signature which likely reflects the need to overcome the active rule representation (Exp. 7-8). The present results are a first, detailed step towards characterising the cognitive implications of deliberate rule violations. Yet, different mechanisms might account for the observed effects; plausible candidates are continued but irrational expectations of negative consequences or, on a different note, difficulty relating to a complex representation of rule violations, e.g., as a combination of the rule itself and its negation. The differential contribution of both mechanisms to cognitive conflict during rule violations seems to be a promising field for future inquiry. The same is true for a possible extension of the present experimental approach to social situations and the investigation of expected sanctions and their impact on rule violations. Here, it seems especially relevant to address the contribution of the described conflict to decisions on whether or not to violate a rule in the first place. Pfister, R. (2010). Pinpointing ideomotor effect anticipations in the human brain. Diploma Thesis, Julius-Maximilians University of W�rzburg, Germany. Nearly two centuries after Johann Friedrich Herbart formulated the first concepts of what should later be called the ideomotor principle of action, we still do not have a precise understanding of the mechanisms linking ideas on the one hand and motor commands on the other hand. The present series of experiments closes two empirical gaps in ideomotor research. Experiment 1 and 2 investigated whether ideomotor theory accounts for action control under rapidly varying action-effect relations, a setting that comes closer to daily actions than previous studies did. To this end, I employed a response-effect (R-E) compa-tibility design with context-specific R-E relations that varied trial-to-trial. Participants pressed a left or right key and produced spatially compatible, neutral, or incompatible action effects. Experiment 1 compared two groups of participants that could either freely choose their actions or reacted to imperative stimuli. In accordance with the theory of action control modes, R-E compatibility effects only resulted for freely chosen actions whereas no effects occurred for forced choice reactions. Experiment 2 showed that R-E compatibility effects, however, can result for both types of action when free and forced choices occur equally often in the same experimental block. Taken together, these findings suggest that ideomotor theory can indeed account for action control under ecologically valid settings. Experiment 3 and 4 modified the design in order to suit the demands of functional magnetic resonance imaging (fMRI). By using a relatively small proportion of free choice trials, R-E compatibility effects resulted only for free choice trials even though free and forced choice trials occurred in the same experimental block. This behavioural marker of effect anticipation then served as regressor for the fMRI response. Within the contrast of free versus forced choice trials, the behavioural effect correlated with the activity in several circumscribed regions, most importantly the hippocampal formation and the inferior parietal lobule. This analysis is the first neurophysiological demonstration of action control via action effect anticipations as suggested by ideomotor theory. Pfister, R. (2009). Expert's eye: Presenting eye-movement patterns to train visual search in complex geophysical displays. 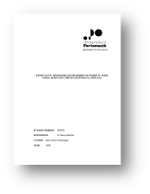 BSc-Thesis, University of Portsmouth, UK. Trainability of visual search strategies on coloured displays and the impact of perceptual uniformity of the colour scale were assessed. Participants were asked to search for four targets in red-white-blue (RWB) displays while their eye movements were recorded. These displays were mainly composed of distracting noise and were designed to correspond to spatial frequencies tra-ditionally encountered in geophysical data images. The present study repli-cates previous findings that perceptual uniformity is a necessary prerequisite for the spontaneous application of a colour-based search strategy in RWB displays. It is further demonstrated that the application of this strategy is even more pronounced when novice participants are trained with eye-movement patterns of an expert in geophysical data images. Half of the participants were therefore shown video recordings of the gaze position of an expert scanning the displays whereas the other half was shown a static presentation of the images. This brief training session of approximately 6-7 minutes was shown to encourage the use of a colour based search strategy on uniform displays whereas it had no effect for non-uniform displays. It was also shown to in-crease the search speed slightly but regardless of the colour scale used. The enhanced application of the search by colour strategy after training with eye-movement patterns corroborates the use of uniform colour scales and pro-vides an easy-to-implement training method for further improving visual search behaviour. Pfister, R., & Wirth, R. (2018). Reading action intentions from movement trajectories. Talk at the 51st Kongress der Deutschen Gesellschaft f�r Psychologie (DGPs), September 2018, Frankfurt, Germany. Cognitive states such as action intentions leave a fingerprint on human behavior by shaping body movements. Movement trajectories thus provide a unique and elegant tool to uncover such hidden cognitive states, and we will sketch how the method of studying continuous trajectories of computer-mouse movements has evolved over the last decade. We will discuss two spotlights to show how the method can be fruitfully employed in different areas of psychological research. The first spotlight comes from the domain of human action control, and demonstrates how basic action intentions � anticipations of to-be-produced consequences of own body movements � are mirrored in trajectory deflections. The second spotlight features the assessment of cognitive conflict during rule violation behavior in clinically relevant samples. These examples underline the promise of employing hand- and mouse-tracking in both basic and applied research. Pfister, R., Pfeuffer, C. U., Foerster, A., Przybylski, F., & Kiesel, A. (2017). Binding lies: Flexible retrieval of honest and dishonest responses. Talk at the 59th Tagung experimentell arbeitender Psychologen (TeaP), March 2017, Dresden, Germany. Dishonesty can take a toll on the liar�s memory, because he or she needs to tell a consistent lies not only in one instance but also across multiple occasions. We tested whether this toll is mitigated by associative learning, i.e., by associations between a question and its corresponding response and by associations between a question and its previous intentional context (honest vs. dishonest responding). Results indicated automatic retrieval of the response to a question if, and only if, the intentional context repeated but not when it switched between a prime and a later probe trial. These findings indicate hierarchical associations between (dis-)honest intentions, questions, and the corresponding responses, which allows for flexible, context-specific retrieval. Pfister, R. (2016). Bewusste Regelverst��e aus Sicht des Regelbrechers: Ein empirischer Perspektivwechsel. Talk at the 50th Kongress der Deutschen Gesellschaft f�r Psychologie (DGPs), September 2016, Leipzig, Germany. Bewusste Verst��e gegen Regeln und soziale Normen sind in der psychologischen Forschung bisher fast ausschlie�lich aus der Beobachter-Perspektive untersucht worden. Empirische Untersuchungen zielten dementsprechend darauf ab, das Auftreten eines Regelversto�es auf Basis situativer und interindividueller Pr�diktorvariablen vorherzusagen, sowie die Reaktion von Dritten auf beobachtete Regelverst��e zu erfassen. Der Fokus der Beobachter-Perspektive hat dabei zahlreiche wichtige Befunde zum Verst�ndnis von regel- bzw. normverletzendem Verhalten zutage gef�rdert. Gleichzeitig bringt dieser Fokus jedoch auch eine wichtige Einschr�nkung mit sich: Die kognitiven und affektiven Prozesse, die beim Regelbrecher genau zum Zeitpunkt eines Regelversto�es ablaufen, sind der Beobachter-Perspektive nicht zug�nglich. Eine k�rzlich entwickelte, individuelle Perspektive legt den Fokus daher auf eben diese kognitiven und affektiven Prozesse und erm�glicht somit einen neuartigen Zugang zum Ph�nomen bewusster Regelverst��e. Erste empirische Untersuchungen in dieser individuellen Perspektive zeigen in der Tat bemerkenswerte Eigenheiten regelwidrigen Verhaltens in Bezug auf Handlungsplanung, Bewegungstrajektorien, elektrophysiologische Ma�e sowie direkte affektive Verhaltenskonsequenzen. Ich m�chte diese Befunde schlaglichtartig vorstellen, sowie weitere Forschungsfragen diskutieren, die sich im Kontext einer individuellen Perspektive vis-�-vis einer Beobachter-Perspektive auf bewusste Regelverst��e er�ffnen. Pfister, R., Burger, S., Schwarz, K. A., Dignath, D., & Kunde, W. (2016). Action-effect binding meets agency. Poster presented at the 58th Tagung experimentell arbeitender Psychologen (TeaP), March 2016, Heidelberg, Germany. The subjective feeling of agency is a pervasive phenomenon that accompanies intentional actions. Feelings of agency are typically explained in terms of predictive mechanisms � mostly equated with internal forward models � and in terms of postdictive mechanisms � mostly equated with retrospective judgments �, with both mechanisms supplementing each other. We present new evidence for a third mechanism that contributes to feelings of agency: The integration of action and effect in an event file. More precisely, short-term integration of action and effect (measured via the retrieval of an effect-associated response) predicted agency ratings on a trial-to-trial level. This finding opens up a new perspective on feelings of agency and represents a first step towards reconciling theories on the sense of agency with effect-based accounts of human action control. Pfister, R., Janczyk, M., Wirth, R., Dignath, D., & Kunde, W. (2015). Thinking with portals: Revisiting kinematic cues to intention. Poster presented at the 57th Tagung experimentell arbeitender Psychologen (TeaP), March 2015, Hildesheim, Germany. What we intend to achieve with our actions affects the way we move our body. This has been repeatedly shown for both, movement-related intentions such as grasping and turning an object, and relatively high-level intentions such as the intention to collaborate or to compete with a social partner. The impact of an intermediate level of intentions � referring to action-contingent changes in the physical environment � is far less clear, however. We present three experiments that aim at scrutinizing this level of analysis by showing how such anticipated consequences affect movement trajectories. Participants steered a virtual avatar toward portals that displaced the avatar to a different but predictable location. Even though this displacement occurred only after the movement was completed, hand movements were clearly torn toward the anticipated final location of the avatar. These results show that properties of anticipated action consequences leave a fingerprint on movement trajectories and provide an opportunity to unite previous accounts on the relation of intentions and movements with general frameworks of action planning. Pfister, R., Schwarz, K. A., Wirth, R., Steinhauser, M., & Kunde, W. (2014). Of chickens, eggs, and yolk: The electrophysiology of breaking a rule. Poster presented at the 20th Annual Meeting of the Organization for Human Brain Mapping (HBM), June 2014, Hamburg, Germany. Pfister, R., Schwarz, K. A., Wirth, R., Steinhauser, M., & Kunde, W. (2014). Of chickens, eggs, and yolk: The electrophysiology of breaking a rule. Talk at the 56th Tagung experimentell arbeitender Psychologen (TeaP), April 2014, Gie�en, Germany. Human agents follow rules by default, and violating even simple rules yields cognitive conflict for the rule breaker. Previous experiments showed this conflict in various behavioural measures including response times and movement trajectories. Based on these experiments, we investigated the electrophysiological signature of rule violations. Most notably, rule violations are characterized by an attenuated P300 component when evaluating the stimulus prompting the behaviour, most likely reflecting increased response complexity. In addition to documenting this electrophysiological signature, our results reinforce theories that assume the P300 component to reflect the retrieval of learned stimulus-response associations, a process that clearly needs to be inhibited to allow for successful rule violation. Pfister, R., Wirth, R., Schwarz, K. A., & Kunde, W. (2013). 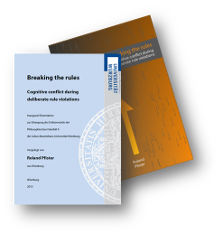 Breaking the rules: Cognitive conflict during deliberate rule violations. Poster presented at the 54th Annual Meeting of the Psychonomic Society (Psychonomics), November 2013, Toronto, Canada. Not all rules can be obeyed at all times � and violating a rule has various consequences beyond its obvious ethical and legal implications. It is unknown, however, whether the simple fact of violating a rule (i.e., committing an error by intention) leaves a fingerprint on the acting agent, especially in the absence of any negative outcomes. A line of behavioural experiments targets this question using reaction time and trajectory data. Converging results indicate that cognitive conflict does indeed arise during rule violations even in such restricted settings. In turn, anticipating this conflict might bias decisions whether to violate a rule or not in the first place. Pfister, R., Foerster, A., & Kunde, W. (2013). Pants on fire: Electrophysiological effects of telling a lie. Poster presented at the 19th Annual Meeting of the Organization for Human Brain Mapping (HBM), June 2013, Seattle, WA, USA. The phenomenon of lying has been studied from two very distinct neuroscientific perspectives, one focusing on lie detection and the other focusing on the processes accompanying active lying. The intense discussion of lie detection centers around polygraphic techniques and neurophysiological measures such as electroencephalography (EEG; Farwell & Donchin, 1991) and functional magnetic resonance imaging (fMRI; Davatzikos et al., 2005). In this tradition, lie detection is typically studied in terms of increased responses to personally relevant items or �guilty knowledge�. Interestingly, active lying is studied by a rather different community that relies on distinct experimental paradigms such as the Sheffield lie test (Spence et al., 2001). Whereas recent years have seen considerable progress in uncovering the correlates of active lying in behavioral and fMRI data (Spence et al., 2008), the electrophysiological impact of active lying is not well understood. The present study pioneers this question with two experiments. These experiments also represent a first step toward disentangling the processes of deciding whether to lie or not and actually telling a lie. Thirty-two participants were asked to help a virtual police officer to locate a knife (Fig. 1). They signaled at the beginning of each trial whether they would tell the truth about the knife�s location or whether they would lie about it (referred to as intention hereafter). Then, they saw a shelf containing the knife at one of two positions and informed the officer via keypress about the knife�s location (referred to as target hereafter). In Experiment 1, each response to the target stimulus was followed by visual feedback (happy vs. sad officer) whereas Experiment 2 did not involve any feedback. We recorded EEG activity at 500 Hz throughout the experimental session via 32 active electrodes positioned in the extended 10/20 system (actiCAP; Brain Products, Germany) using a BrainVision QuickAmp amplifier. The EEG signal was segmented into separate epochs around the intention stimulus and the target stimulus, respectively, and we compared the event-related potentials (ERPs) between truth and lie trials. Additionally, we analyzed the participants� choice behavior and reaction times (RTs) in each condition. Participants showed a slight but consistent preference for truthful responses over lies (53.5% vs. 46.5%). 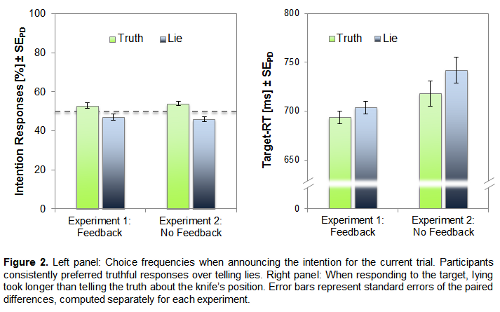 Furthermore, participants responded faster when announcing a lie than when announcing to tell the truth in Experiment 2 but not in Experiment 1. When actually performing the lie, however, participants were considerably slower than when telling the truth across both experiments (Fig. 2). The corresponding ERPs related to the intention stimulus and to the target stimulus are plotted for electrode Cz in Figure 1. For the intention stimulus, lie and truth trials did not differ, whereas for the target stimulus lie trials showed a markedly attenuated P300 response as compared to truth trials. This effect was present across the central midline electrodes in both experiments (Fig. 3). The present experiments explored the electrophysiological correlates of active lying. Results indicate that only telling a lie but not the corresponding deliberation differs from truthful behavior. The marked differences for telling a lie are in line with previous behavioral (Debey et al., 2012) and fMRI (Bhatt et al., 2009) data suggesting that telling a lie is clearly more effortful than telling the truth, as P300 attenuation is typically caused by complex tasks and high working memory load (Kok, 2001). 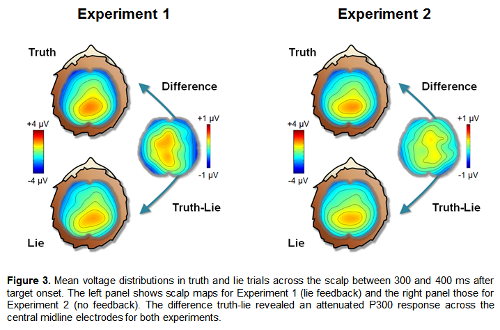 Furthermore, these results present a challenge for EEG-based algorithms for lie detection that usually rely on an increased P300 in response to personally relevant information whereas our findings suggest an opposite impact of actually telling a lie. Bhatt, S., Mbwana, J., Adeyemo, A., Sawyer, A., Hailu, A., & VanMeter, J. (2009), �Lying about facial recognition: An fMRI study�, Brain and Cognition, vol. 69, no. 2, pp. 382-390. Davatzikos, C., Ruparel, K., Fan, Y., Shen, D.G., Acharyya, M., Loughhead, J.W., Gur, R.C., & Langleben, D.D. (2005), 'Classifying spatial patterns of brain activity with machine learning methods: Application to lie detection', NeuroImage, vol. 28, no. 3, pp. 663-668. Debey, E., Verschuere, B., & Crombez, G. (2012), �Lying and executive control: An experimental investigation using ego depletion and goal neglect.�, Acta Psychologica, vol. 140, no. 2, pp. 133-141. Farwell, L.A., & Donchin, E. (1991), �The truth will out: Interrogative Polygraphy (�lie detection�) with event-related brain potentials�, Psychophysiology, vol. 28, no. 5, pp. 531-547. Kok, A. (2001), �On the utility of P3 amplitude as a measure of processing capacity�, Psychophysiology, vol. 38, no. 3, pp. 557-577. Spence, S.A., Farrow, T.F.D., Herford, A.E., Wilkinson, I.D., Zheng, Y., & Woodruff, P.W.R. (2001), �Behavioural and functional anatomical correlates of deception in humans�, NeuroReport, vol. 12, no. 13, pp. 2849-2853. Spence, S.A., Kaylor-Hughes, C., Farrow, T.F.D., & Wilkinson, I. D. (2008), 'Speaking of secrets and lies: The contribution to ventrolateral prefrontal cortex to vocal deception. ', NeuroImage, vol. 40, no. 3, pp. 1411-1418. Pfister, R. (2013). chIch Qaghmey joq pab wem: W(h)orf's Hypothese und ihre Folgen. Poster presented at the 2nd Doktorandenworkshop Allgemeine Psychologie, June 2013, Trier, Germany. Wilhelm von Humboldt hat in seinem Aufsatz ��ber die Verschiedenheit des menschlichen Sprachbaus und ihren Einfluss auf die geistige Entwicklung des Menschengeschlechts� skizziert, wie sprachliche Eigenheiten das Denken beeinflussen k�nnen. Inuit k�nnen beispielsweise deutlich elaborierter �ber verschiedene Arten von Schnee nachdenken als der handels�bliche deutschsprachige Nachwuchswissenschaftler. �hnliche �berlegungen wurden sp�ter von Benjamin Lee Whorf ge�u�ert und sind so als �Whorf�sche Hypothese� in die Sprachwissenschaft eingegangen. Doch was hat diese Hypothese mit psychologischen Doktorarbeiten zu tun? Dieser Frage m�chte ich mit Hinblick auf klingonische Schlachtrufe und einschl�gige Hardrock-Texte nachgehen. Pfister, R., & Kunde, W. (2013). Of chickens, eggs, and yolk: The electrophysiology of breaking a rule. Poster presented at the 39th Tagung Psychologie und Gehirn (PuG), May/June 2013, W�rzburg, Germany. Not all rules can be obeyed at all times, and failures to obey a rule can be either unintended or intended. Unintended failures to obey a rule (errors and mistakes) have been studied intensely in the area of cognitive neuroscience and such errors are characterized by a distinct event-related potential, known as the error-related negativity (ERN). In contrast, intended failures to obey a rule (violations) have not been studied neuroscientifically to date. We are the first to present data addressing this phenomenon and our results suggest that violations do not yield an ERN-like component. Rather, they seem to be characterized by an attenuated P300 component when evaluating the stimulus prompting the rule-violating behavior, possibly reflecting increased response complexity. These data represent a first neuroscientific step towards characterizing the processes underlying intended rule violations in healthy individuals. Pfister, R., Wirth, R., & Kunde, W. (2013). Breaking the law: Intentional errors and their behavioural consequences. Talk at the 55th Tagung experimentell arbeitender Psychologen (TeaP), March 2013, Vienna, Austria. Not all rules can be obeyed at all times � and violating a rule by intention has various consequences beyond its obvious ethical and legal implications. It is unknown, however, whether the simple fact of violating a rule (i.e., committing an error by intention) leaves a fingerprint on the acting agent. A line of behavioural experiments targets this question using reaction time and trajectory data. Converging results indicate that intentional errors are indeed separable from typical intentional actions while also being distinct from errors that are committed by mistake. Pfister, R., Janczyk, M., Dignath, D., Hommel, B., & Kunde, W. (2012). It takes two to imitate: Imitation and anticipation in social interaction. Poster presented at the 53rd Annual Meeting of the Psychonomic Society (Psychonomics), November 2012, Minneapolis, MN, USA. Imitation is assumed to serve crucial functions in social interaction, including action understanding, empathy, and learning; yet all these functions only apply to the imitating observer. Here, we reveal a distinct function of imitation for the action model: Anticipating to be imitated facilitates the production of one�s own motor actions. Specifically, anticipated motor responses of social counterparts serve as mental cues to retrieve corresponding motor commands in order to orchestrate one�s own actions. Pfister, R., Pohl, C., Kiesel, A., & Kunde, W. (2012). Your unconscious knows your name. Poster presented at the 16th Annual Meeting of the Association for the Scientific Study of Consciousness (ASSC), July 2012, Brighton, UK. The own name constitutes a unique part of conscious awareness, but it is also unique for the unconscious mind? To answer this question, we employed a subliminal priming experiment. Participants decided as fast as possible whether a name or a non-word was presented as target. Unbeknown to them, already before the target, a masked prime stimulus was briefly presented. The prime was either one of the targets, a non-word, the own name of the participant, or the name of a yoked participant. When one's own name was presented as prime, responding to a name target was substantially facilitated, whereas presenting the name of the other participant had the same effect as presenting a non-word prime. Thus, we show that - in contrast to any other name - one's own name has the power to bias a person's actions, even when the presence of the own name is unexpected and unconscious. The brain identifies and processes its name even in the absence of conscious awareness. Pfister, R., Janczyk, M., Dignath, D., Hommel, B., & Kunde, W. (2012). It takes two to imitate: Imitation and anticipation in social interaction. Talk at the 54th Tagung experimentell arbeitender Psychologen (TeaP), April 2012, Mannheim, Germany. Janczyk, M., & Pfister, R. (2012). To choose or not to choose: Stimulus- and intention-based processes in action control. Symposium at the 54th Tagung experimentell arbeitender Psychologen (TeaP), April 2012, Mannheim, Germany. Does it make a difference whether we perform a freely chosen action or whether we respond immediately to environmental demands? Recent research in psychology and neuroscience suggests that both types of actions are functionally dissociable. Although several accounts have been proposed, such as the distinction between stimulus- and intention-based processes, the exact mechanisms and functional characteristics remained controversial. This symposium addresses how such processes can be captured by neurophysiological and behavioural methods. More precisely, we will discuss how stimulus- and intention-based processes (1) mediate the acquisition of behavioural competence, (2) compete or interact in immediate action control, and (3) express themselves in social interaction. Pfister, R. (2012). Wardrobe malfunctions and the measurement of internet behaviour. Poster presented at the 1st International Internet Conference on Recent Advances in Cognitive Psychology (IICRACP), March 2012, National University of Ostroh, Ukraine. Kiesel, A., Waszak, F., & Pfister, R.* (2011). Top-down vs. bottom-up: When instructions overcome automatic retrieval. Talk at the 52nd Annual Meeting of the Psychonomic Society (Psychonomics), November 2011, Seattle, WA, USA. (* = Presenting Author). Research on human action has extensively covered controlled and automatic processes in the transformation of stimulus information into motor action, and how conflict between both systems is solved. However, the question of whether automatic S-R translation per se depends on top-down control states has received little attention. This study addressed this issue by manipulating top-down control state (instructed S-R mapping) and automatic bottom-up processing (retrieval of S-R memory traces) independently from each other. Using a color/shape task-switching paradigm, we compared cross-talk triggered by distractor stimuli, for which the instructed S-R mapping and the S-R associations compiled at the beginning of the experiment matched, with the cross-talk triggered by distractor stimuli, for which (re)instructed mapping and compiled S-R associations did not match. Interestingly, the latter kind of distractors did not yield any cross-talk, demonstrating that automatic S-R retrieval occurs only if the S-R associations concur with the currently valid S-R mapping. Pfister, R., Janczyk, M., Heinemann, A., Thomaschke, R., & Kiesel, A. (2011). You don�t see what you expect to see: Blindness to learned action effects. Poster presented at the 52nd Annual Meeting of the Psychonomic Society (Psychonomics), November 2011, Seattle, WA, USA. If a prepared action shares one or more features with an action-irrelevant stimulus in the environment, accurate perception and identification of the stimulus are impaired. This phenomenon (known as Action-Effect-Blindness, AEB) was demonstrated with overlapping proximal action features (e.g., left vs. right key presses) and features of distal stimuli (e.g., arrowheads). The present study expands the AEB phenomenon to learned action effects which are assumed to become endogenously activated as part of ideomotor action control. We show that the anticipation of an action effect shields its representation from other processes � impairing reactions to this stimulus if it is presented exogenously. This finding indicates that AEB is not due to interference of mere physical stimulus and response features but plays a functional role for perception in action. Pfister, R., Melcher, T., Kiesel, A., Dechent, P., & Gruber, O. (2011). How sensory anticipations in the human brain control motor action. Talk at the 17th Annual Meeting of the European Society for Cognitive Psychology (ESCoP), September 2011, Donostia-San Sebastian, Spain. How does our mind produce physical action of our body? How are goals transformed into overt behaviour? For about 200 years, philosophers and psychologists hypothesized the transformation from mind to body to occur via the anticipation of sensory consequences of an action. And whereas there is ample evidence for this hypothesis in behavioural experiments, the neural underpinnings of action control via sensory anticipations are virtually unknown. Consequently, current neuroscientific models of action control do not account for this mechanism. Using a response-effect compatibility paradigm and functional magnetic resonance imaging, the present study identified the inferior parietal cortex and the parahippocampal gyrus as key regions for this type of action control. These findings set the stage for a neuroscientific framework for explaining action control by sensory anticipations and thus a potential synthesis of psychological and neuroscientific approaches to human action. Pfister, R., Melcher, T., Kiesel, A., Dechent, P., & Gruber, O. (2011). How sensory anticipations in the human brain control motor action. Poster presented at the 17th Annual Meeting of the Organization for Human Brain Mapping (HBM), June 2011, Quebec City, Canada. Recent imaging studies set out to investigate the neural correlate of ideomotor theory, a classical philosophical approach to action control. Ideomotor theory assumes the brain to store bidirectional associations of actions and following sensory changes to address an action by anticipating its sensory effects. While several studies found neurophysiological evidence for the learning process underlying ideomotor action control (K�hn et al., 2010; Melcher et al., 2008), the process of action control by sensory effect anticipations has not yet been studied on the neural level. We adopted a well-established behavioral paradigm to measure ideomotor effect anticipations � the R-E compatibility paradigm (Kunde, 2001; Pfister et al., 2010) � and modified it for event-related fMRI (see Figure A). Participants pressed a left or right response button and produced spatially compatible, neutral, or incompatible visual action effects. As an additional variation, participants either selected the response endogenously or reacted according to a target stimulus (exogenous selection). We hypothesized this manipulation to result in more pronounced ideomotor effect anticipations for endogenously selected actions than for exogenously selected actions, preparing the ground for fMRI contrast analysis. Behavioral results confirmed our hypothesis: Response-effect compatibility influenced reaction times for endogenously selected actions but had no impact for exogenously selected actions. Individual R-E compatibility effects � a pure measure for ideomotor effect anticipations � were then used as regressors for the BOLD signal within the contrast endogenous vs. exogenous selection (Figure B and C). This analysis identified the left inferior parietal cortex as well as the parahippocampal gyrus as cornerstones of a neural network subserving action control by sensory effect anticipations. In accordance with recent findings on the neural implementation of action planning (Desmurget et al., 2009) and action effect processing (K�hn et al., 2010; Melcher et al., 2008), the present findings point to a pronounced role of imaginative sensory processes in parietal circuits even in early stages of action control. This notion supplements classical models of human action control (cf. Haggard, 2008) that assume a predominant role of the prefrontal cortex but do not account for the functional role of sensory anticipations for action selection and initiation. Desmurget, M., et al. (2009). Movement Intention After Parietal Cortex Stimulation in Humans. Science, 324(5928), 811-813. DOI: 10.1126/science.1169896. Haggard, P. (2008). Human volition: Towards a neuroscience of will. Nature Reviews Neuroscience, 9(12), 934-946. DOI: 10.1038/nrn2497. K�hn, S., et al. (2010). The Internal Anticipation of Sensory Action Effects: When Action Induces FFA and PPA Activity. Frontiers in Human Neuroscience, 4(54), 1-7. DOI: 10.3389/fnhum.2010.00054. Kunde, W. (2001). Response-effect compatibility in manual choice reaction tasks. Journal of Experimental Psychology: Human Perception and Performance, 27(2), 387-394. DOI: 10.1037/0096-1523.27.2.387. Melcher, T., et al. (2008). The neural substrate of the ideomotor principle: An event-related fMRI analysis. NeuroImage, 39(3), 1274-1288. DOI: 10.1016/j.neuroimage.2007.09.049. Pfister, R., et al. (2010). Adaptive Control of Ideomotor Effect Anticipations. Acta Psychologica, 135(3), 316-322. DOI: 10.1016/j.actpsy.2010.08.006. Melcher, T., Hommel, B., Winter, D., Pfister, R.*, & Gruber, O. (2011). Evidenz aus der funktionellen Hirnbildgebung f�r eine grundlegende Hand-/Seitenasymmetrie ideomotorischer Prozesse. [A fundamental hand-difference in ideomotor processing: Evidence from functional imaging]. Talk at the 53rd Tagung experimentell arbeitender Psychologen (TeaP), March 2011, Martin-Luther-University Halle-Wittenberg, Germany. (* = Presenting Author). Der Beitrag stellt konvergente Evidenz aus zwei fMRT Untersuchungen f�r eine grundlegende Seiten- bzw. Handasymmetrie ideomotorischer Prozesse vor. Die betreffenden Studien verwendeten das von Elsner und Hommel (2001) entwickelte zwei-phasige ideomotorische Lernparadigma, welches die Bestimmung von Hirnaktivierung in Bezug auf zwei basale ideomotorische Prozesse erlaubt: (a) ideomotorisches Lernen (Erwerb erlernter Handlungseffekte) und (b) ideomotorische Handlungsaktivierung (Ausl�sung motorischer Handlungstendenzen durch die passive Wahrnehmung erlernter Handlungseffekte). Aufbauend auf den Befunden einer fr�heren PET-Studie (Elsner et al., 2002) beschreiben die Studienergebnisse ein differenziertes Muster neuronaler Aktivit�t in Bezug auf die Wahrnehmung erlernter Handlungseffekte u.a. in (para-)hippocampalen und (pr�-)motorischen Regionen, als neuronales Substrat ideomotorischer Handlungsaktivierung. Ergebnisse zeigen hier eine deutliche Seitenasymmetrie mit reduzierten oder sogar ausbleibenden Effekten (Hirnaktivierungen) f�r rechtsh�ndige erlernte Handlungseffekte. In einem n�chsten Schritt konnte der relativ st�rkere Handlungsaktivierungseffekt durch linksh�ndige erlernte Handlungseffekte mit relativ st�rkerem Assoziations- bzw. ideomotorischem Lernen f�r linksh�ndige (vs. rechtsh�ndige) Handlungseffekte in Beziehung gesetzt werden. Pfister, R., Melcher, T., Kiesel, A., & Gruber, O. (2011). Gibt es ein neurophysiologisches Korrelat handlungsleitender Effektantizipationen? [Is there a neural correlate of ideomotor effect anticipations?]. Talk at the 53rd Tagung experimentell arbeitender Psychologen (TeaP), March 2011, Martin-Luther-University Halle-Wittenberg, Germany. Wie schafft es unser Gehirn, zielgerichtete Bewegungen unserer Gliedma�en hervorzurufen? Die ideomotorische Hypothese gibt eine einfache und sparsame Antwort auf diese fundamentale Frage: Bidirektionale Verbindungen von Handlungen und Handlungseffekten erm�glichen es, dass Bewegungen �ber die Antizipation ihrer Effekte hervorgerufen werden k�nnen. Trotz stichhaltiger empirischer Evidenz in Verhaltensstudien sind die neurophysiologischen Grundlagen handlungsleitender Effektantizipationen jedoch noch weitestgehend unbekannt. Wir adaptierten daher das Paradigma der Reaktions-Effekt-(R-E)-Kompatibilit�t (Kunde, 2001) f�r die Erfordernisse der funktionalen Magnetresonanztomographie. Mittels eines regressionsanalytischen Ansatzes war es uns m�glich, Ver�nderungen des MR-Signals spezifisch mit Prozessen der Effektantizipation in Verbindung zu bringen. Unsere Ergebnisse deuten hier auf eine wichtige Rolle des inferioren Parietallappens und des Gyrus parahippocampalis hin. Speziell die Aktivierung im inferioren Parietallappen kann dabei plausibel mit Prozessen der Handlungsselektion und -spezifikation in Verbindung gebracht werden und stellt somit ein erstes neurophysiologisches Indiz f�r die funktionale Rolle ideomotorischer Effektantizipationen dar. Pfister, R., Waszak, F., & Kiesel, A. (2010). Wie automatisch sind automatische Prozesse? [How automatic are automatic processes exactly?]. Talk at the 43rd Herbsttreffen experimentelle Kognitionspsychologie (HexKoP), November 2010, Martin-Luther-University Halle-Wittenberg, Germany. Die klassische Unterscheidung von automatischen und kontrollierten Prozessen in der Handlungskontrolle ist bisher vor allem in Experimenten untersucht worden, in denen kontrollierte Verarbeitung gegen st�rende automatische Verarbeitung durchgesetzt werden musste � etwa in der Stroop- oder der Simon-Aufgabe. Es gibt bislang jedoch keine Befunde zu der Frage, ob auch automatische Prozesse selbst von kontrollierten Prozessen beeinflusst werden k�nnen. Zur �berpr�fung dieser Spekulation haben wir automatische Verarbeitung (gelerntes S-R-Mapping) und kontrollierte intentionale Verarbeitung (instruiertes S-R-Mapping) in einem Aufgabenwechselparadigma gezielt gegeneinander ausgespielt. Hierbei verglichen wir Crosstalk von Distraktoren bei denen das S-R-Mapping nach einer Lernphase uminstruiert wurde (uminstruierte Distraktoren) mit solchen, bei denen gelerntes und instruiertes Mapping �bereinstimmten (konstante Distraktoren). Interessanterweise zeigten sich nur bei konstanten Distraktoren �bliche Crosstalk-Effekte, bei uminstruierten Distraktoren jedoch nicht. Scheinbar erfolgt ein automatischer Abruf der gerade gelernten S-R-Verbindungen also nur dann, wenn sie mit der momentanen Handlungsintention �bereinstimmen. Pfister, R., Kiesel, A., & Melcher, T. (2010). Rapidly Varying Ideomotor Effect Anticipations. Poster presented at the 51st Annual Meeting of the Psychonomic Society (Psychonomics), November 2010, St. Louis, MO, USA. According to ideomotor theory, voluntary actions are selected and initiated by means of anticipated action effects. Prior experiments demonstrated these effect anticipations with response�effect (R�E) compatibility phenomena, using blocked R�E relations, whereas daily actions typically produce context-dependent effects. In the present study, we accounted for this natural variability and investigated R�E compatibility, varying R�E compatibility trial by trial. In line with recent findings on ideomotor learning, R�E compatibility influenced responding only when participants responded in free choice trials, assuming that participants then adopted an intention-based action control mode. In contrast, R�E compatibility had no impact when participants responded according to imperative stimuli throughout the experiment�thus, when participants adopted a stimulus-based action control mode. Interestingly, once an intention-based mode was established because of free choice trials within an experimental block, we observed R�E compatibility effects in free as well as forced choice trials. Pfister, R., Kiesel, A., & Melcher, T. (2010). Pinpointing ideomotor effect anticipations in the human brain. Poster presented at the International Summer School on Multimodal Approaches in Neuroscience, July 2010, Max-Planck-Institute for Human Cognitive and Brain Sciences Leipzig, Germany. How can goals be transformed into overt action? How is our brain able to evoke movements of our limbs? Ideomotor theory provides a parsimonious and elegant answer to these fundamental questions: it assumes that representations of actions and their effects are connected bidirectionally so that actions can be triggered by the anticipation of potential action effects. Recent behavioural and neuroimaging research suggests that such ideomotor effect anticipations are most pronounced in freely chosen actions as compared to forced choice reactions. Furthermore, several reports speculated about the neural substrate of ideomotor action control in the vast fronto-parietal network subserving voluntary action. Within this framework, we present a paradigm that directly addresses the neural substrate of ideomotor effect anticipations with event-related fMRI. We employed a response-effect compatibility design with free and forced choice actions (left vs. right key presses) resulting in spatially compatible, neutral, or incompatible action effects. Response-effect compatibility varied on a trial-to-trial basis and a cue informed the participants about the current response-effect mapping at the beginning of each trial. The resulting behavioural markers for ideomotor effect anticipations (response-effect compatibility effects) allowed us to identify the neural correlates of ideomotor action control within the fMRI signal. Pfister, R., Kiesel, A., & Melcher, T. (2010). Ideomotorik, Effektantizipationen und Bewegungs-kontrolle unter realit�tsn�heren Bedingungen. [Ideomotor Theory, Effect Anticipations and the Control of Daily Actions]. Talk at the 52nd Tagung experimentell arbeitender Psychologen (TeaP), March 2010, University of Saarbr�cken, Germany. Das ideomotorische Prinzip postuliert Bewegungskontrolle �ber bidirektionale Assoziationen von Handlungen und darauf folgenden Effekten, sodass Handlungen durch die Antizipation ihrer Effekte hervorgerufen werden k�nnen. Diese ideomotorische Bewegungskontrolle konnte bisher eindrucksvoll in Experimenten nachgewiesen werden, die geblockte Handlungs-Effekt-Beziehungen verwendeten, nicht jedoch wenn Handlungs-Effekt-Beziehungen kontextuell variierten. Um die empirische Evidenz f�r ideomotorische Bewegungskontrolle auf diese nat�rlicheren Situationen zu erweitern, verwendeten wir ein Reaktions-Effekt-Kompatibilit�ts-Paradigma bei dem in jedem Durchgang ein Hinweisreiz �ber die momentane r�umliche Kompatibilit�t von Reaktionstasten und Effekten informierte. Dabei wurden solche Reaktionen schneller initiiert, die zu r�umlich kompatiblen Effekten f�hrten als solche die zu inkompatiblen Effekten f�hrten. Dies gilt allerdings nur wenn die Handlung in einem intentionalen Handlungskontrollmodus ausgef�hrt wird, der durch die freie Wahl zwischen verschiedenen Handlungsalternativen hervorgerufen wird. Wird eine Handlung hingegen in einem reaktiven Modus als Reaktion auf einen imperativen Stimulus ausgef�hrt, scheinen distale Effekte nicht zur Selektion und Steuerung der Handlung herangezogen zu werden. Pfister, R., Kiesel, A., & Melcher, T. (2009). Kann das ideomotorische Prinzip Bewegungskontrolle unter realit�tsnahen Umst�nden erkl�ren? [Can Ideomotor Theory Account for the Control of Daily Actions?]. Talk at the 42nd Herbsttreffen experimentelle Kognitionspsychologie (HexKoP), October 2009, Leibniz Research Centre for Working Environment and Human Factors, Dortmund, Germany. Das ideomotorische Prinzip erkl�rt Bewegungskontrolle �ber bidirektionale Verbindungen von Handlungen und ihren Effekten, sodass Handlungen durch die Antizipation ihrer Effekte aus-gew�hlt und gesteuert werden. Bisher konnte ideomotorische Bewegungskontrolle jedoch nur in speziellen experimentellen Anordnungen eindeutig gezeigt werden, etwa wenn in einem Block-Design eine Handlung immer zu demselben Effekt f�hrte. Wenn ein und dieselbe Handlung jedoch in Abh�ngigkeit des Bewegungskontextes verschiedene arbitr�re Effekte erzeugt, wenn also beispielsweise das Dr�cken eines Knopfes einmal den CD-Player und ein anderes Mal die Mikrowelle aktiviert, wurde bisher keine eindeutige Evidenz f�r derartige Handlungskontrolle berichtet. Mithilfe eines Reaktions-Effekt-Kompatibilit�ts-Paradigmas zeigten wir, dass das ideomotorische Prinzip auch unter diesen Umst�nden einen validen Ansatz zur Handlungskontrolle darstellen kann. In jedem Durchgang wurden die Probanden dabei �ber die derzeitige r�umliche Kompatibilit�t von Reaktionstasten und erzeugten Reizen informiert (kompatibel vs. inkompatibel vs. neutral), wobei solche Reaktionen schneller initiiert wurden, die zu r�umlich kompatiblen Effekten f�hren w�rden als solche die zu inkompatiblen Effekten f�hren w�rden. Dies gilt allerdings nur wenn die Handlung in einem intentionalen Handlungskontrollmodus ausgef�hrt wird, der durch die freie Wahl zwischen verschiedenen Handlungsalternativen hervorgerufen wird. Wird eine Handlung hingegen in einem reaktiven Modus als Reaktion auf einen imperativen Stimulus ausgef�hrt, scheinen distale Effekte nicht zur Selektion und Steuerung der Handlung herangezogen zu werden.